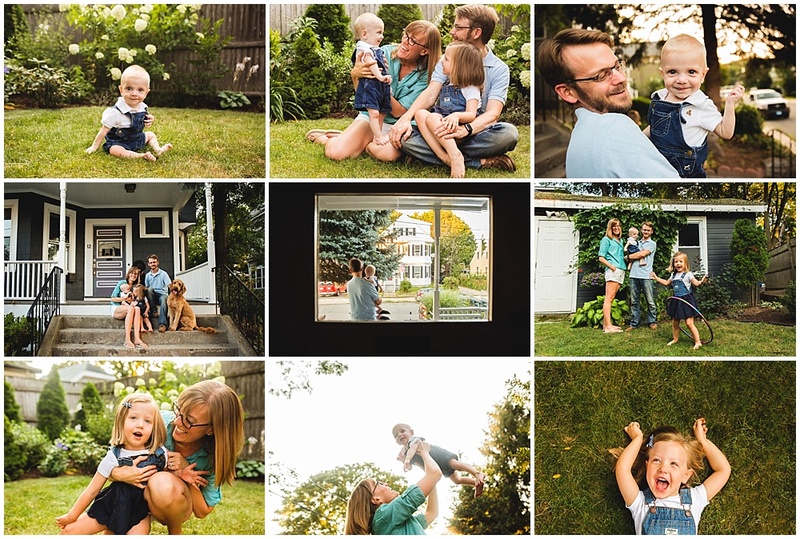 This summer, I met up with a Needham family for a session that was especially near and dear to my heart. 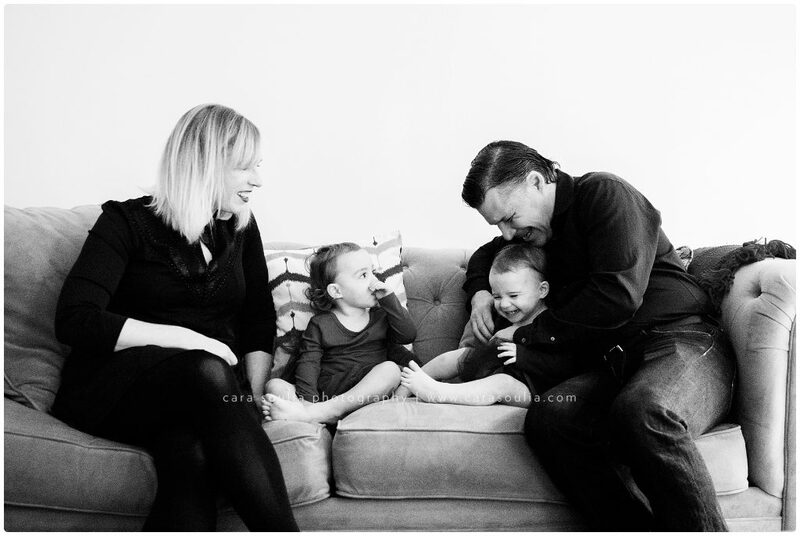 I have known this family of five for a long time now. 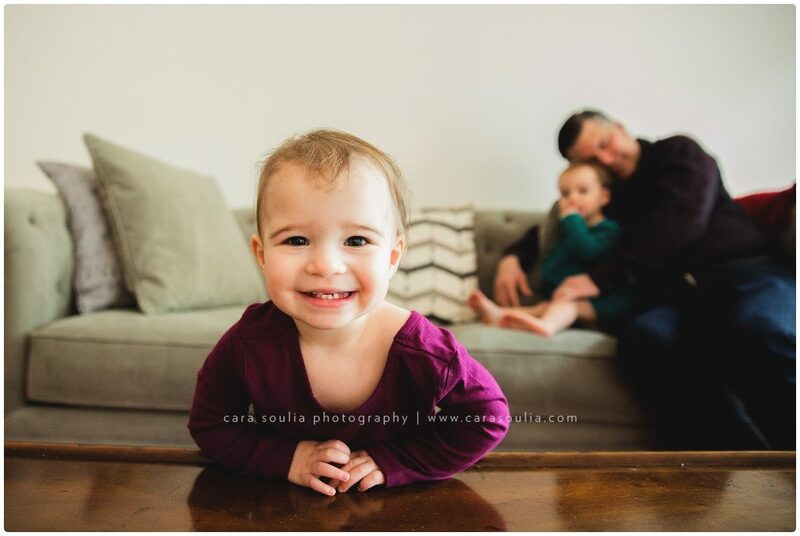 Their older daughter has been good friends with my own daughter since they were in Kindergarten! 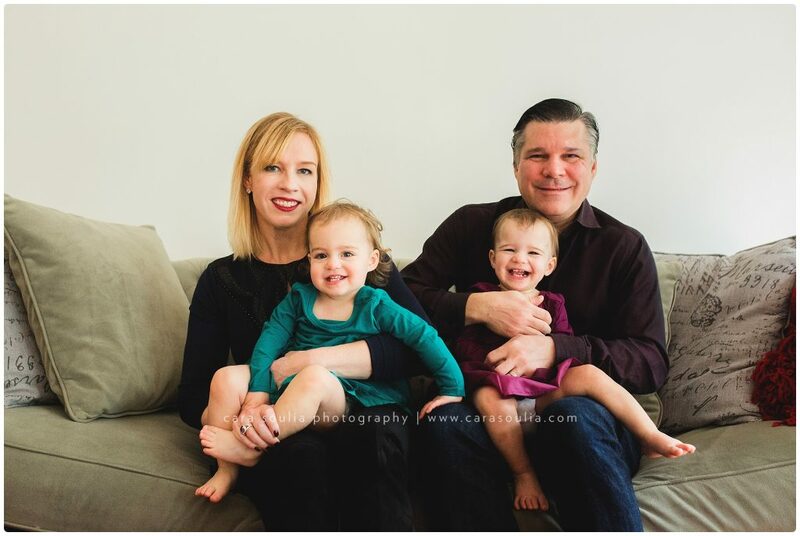 When I heard the news that they would be relocating to the Washington, D.C. area, I knew it would be hard to say goodbye. 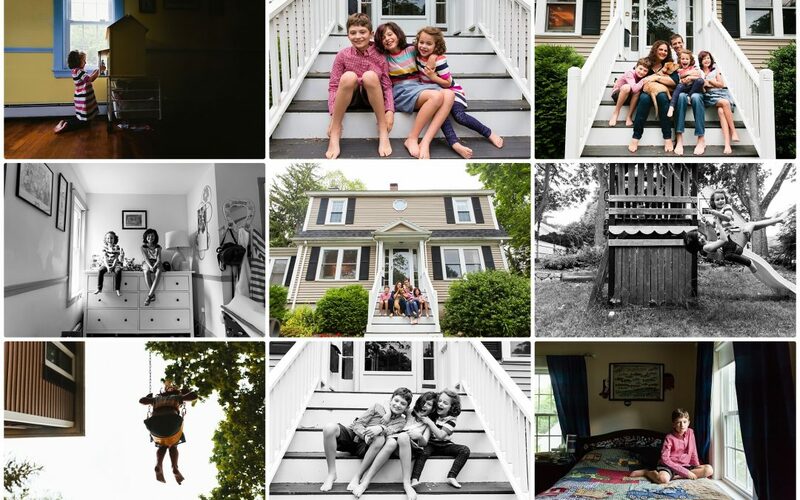 It’s so hard to see friends leave, especially since they’ve built up such an amazing network here in our town. 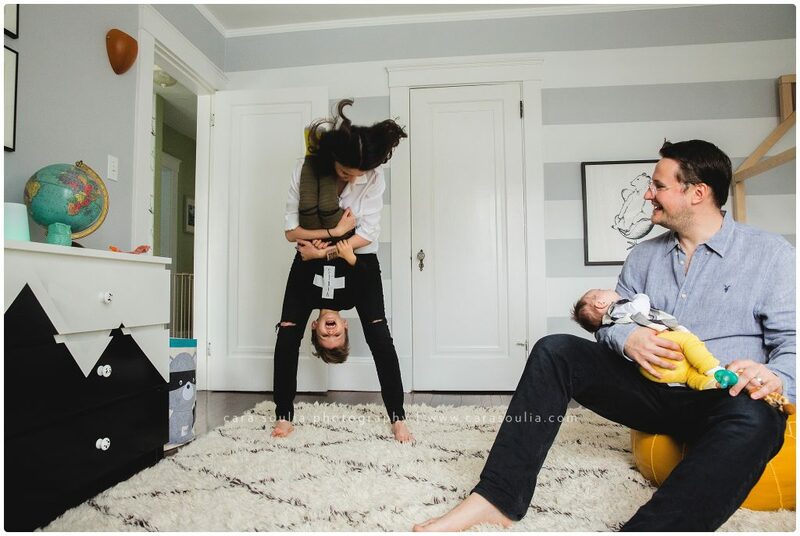 The mom in this family thought it was important to get some photos taken before they moved, and I have to say: I agree wholeheartedly. 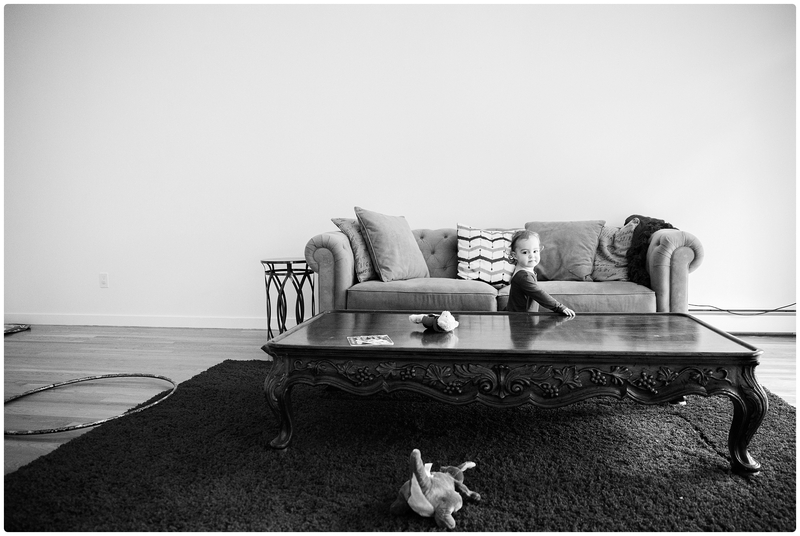 I always tell people to take photos when they move into or out of a home. 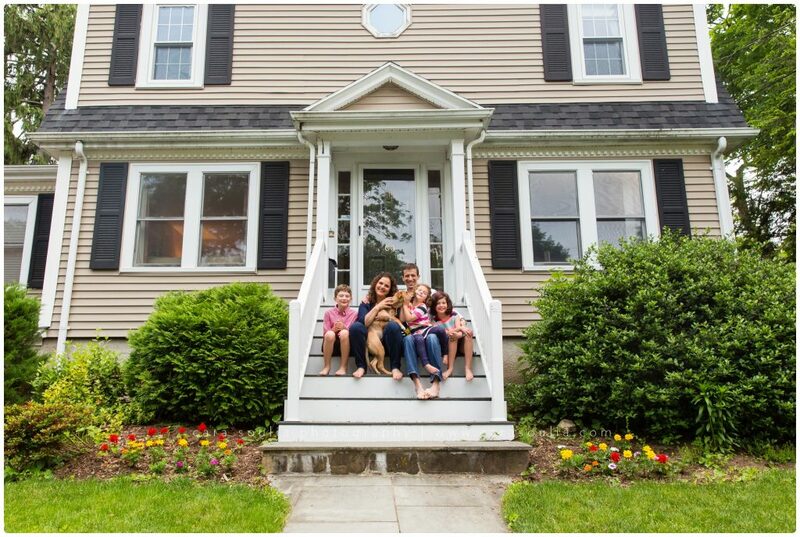 Even if it’s just a simple snapshot on the front steps — it’s one of those important moments you will want to remember. 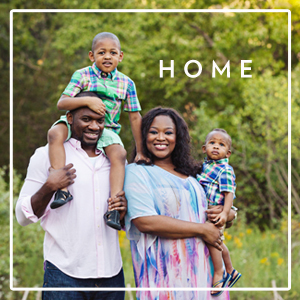 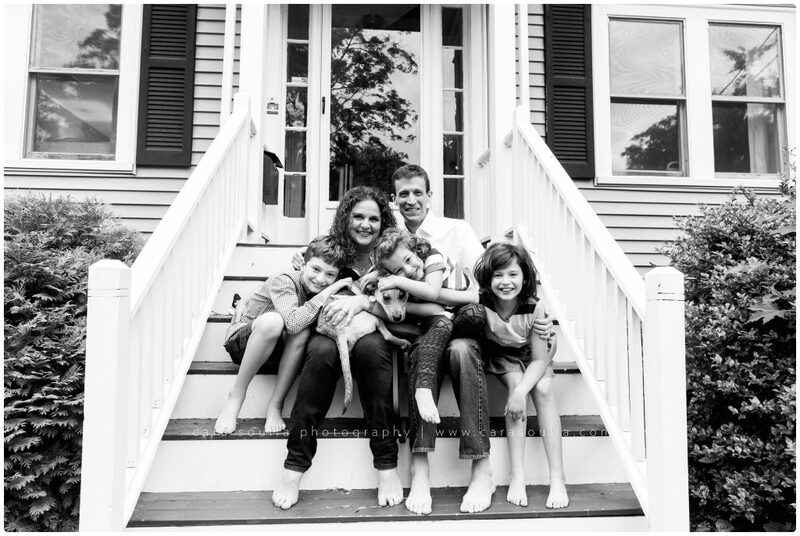 For this family in particular, their home is full of memories and holds great sentimental value. 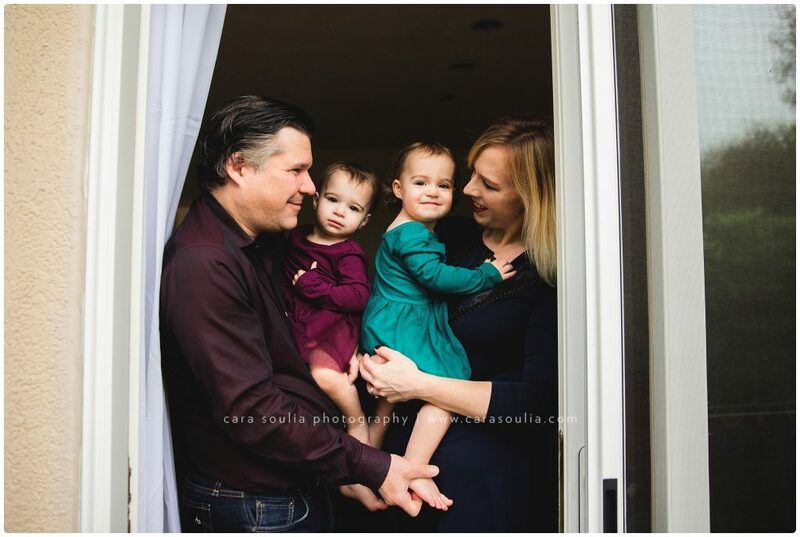 It’s the place where they brought all of their babies home from the hospital, where they took their first steps, and had so many other important firsts. 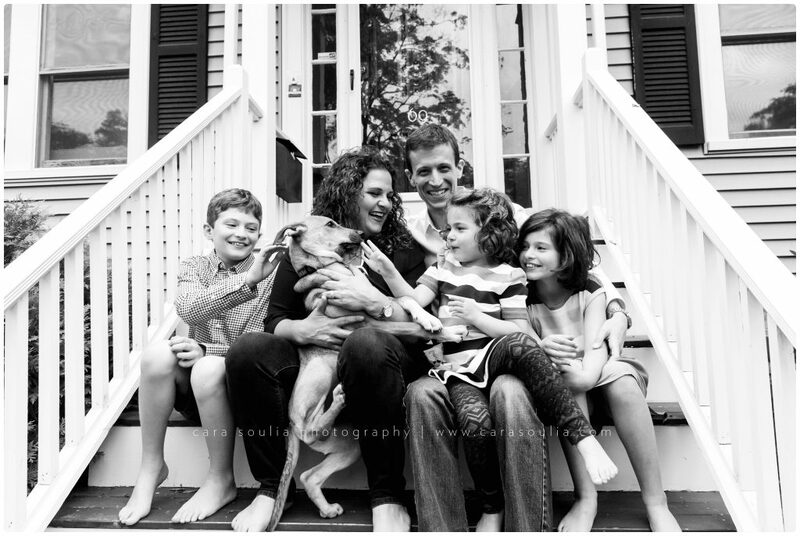 One of my favorite images from this session was when the whole family just snuggled together on the front steps with their new puppy Peanut! 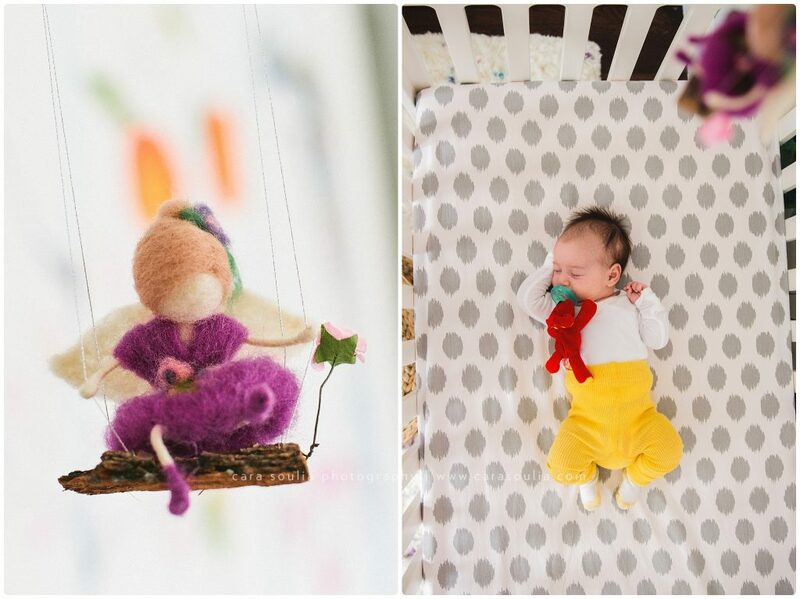 Of course Peanut couldn’t sit still…he was just a few weeks old. 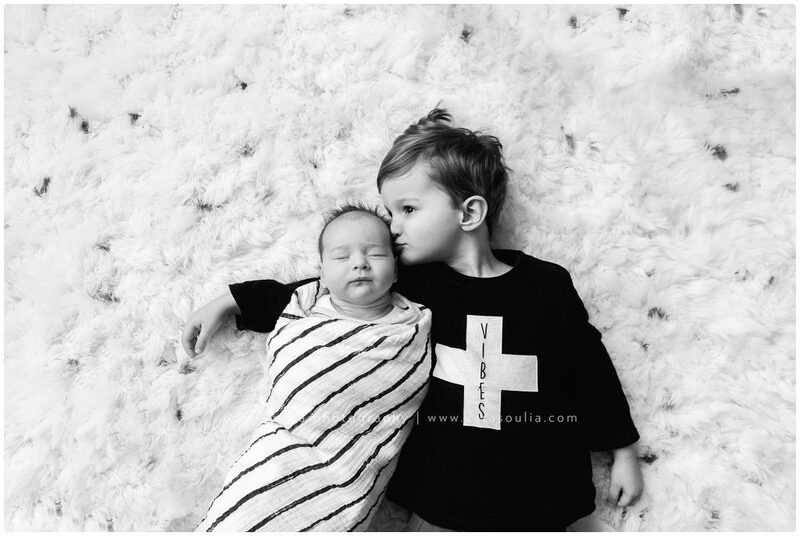 I love how he just jumped up on his big sister to kiss her cheek. 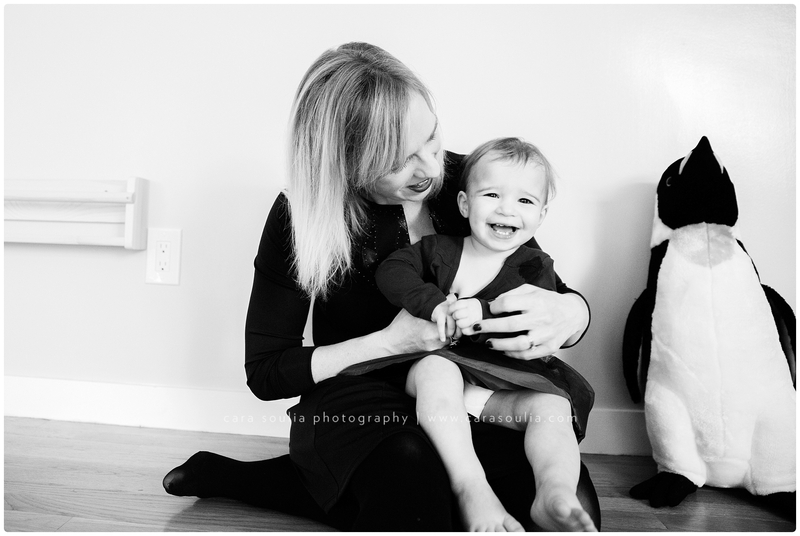 Over the years, I have been inside countless client homes for photo sessions. 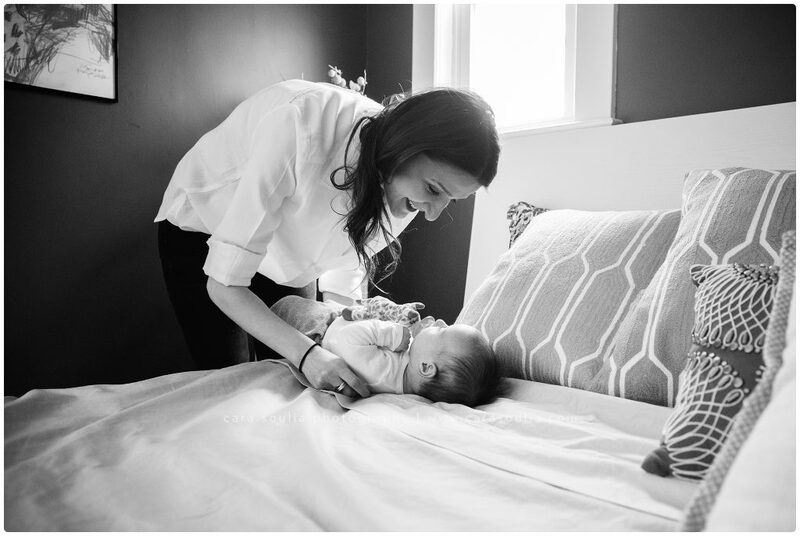 I love meeting people in their personal space, seeing how they live and hearing their stories. 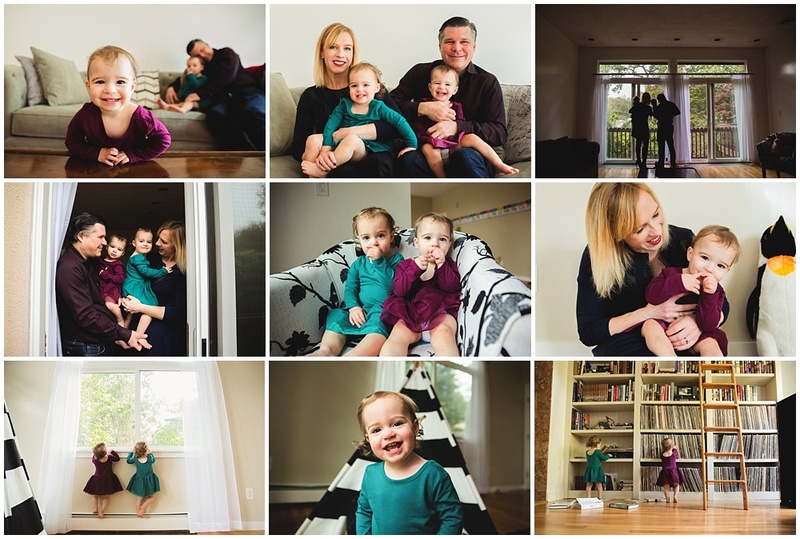 No two at-home sessions are ever alike, which is easily the most fun part of my job! 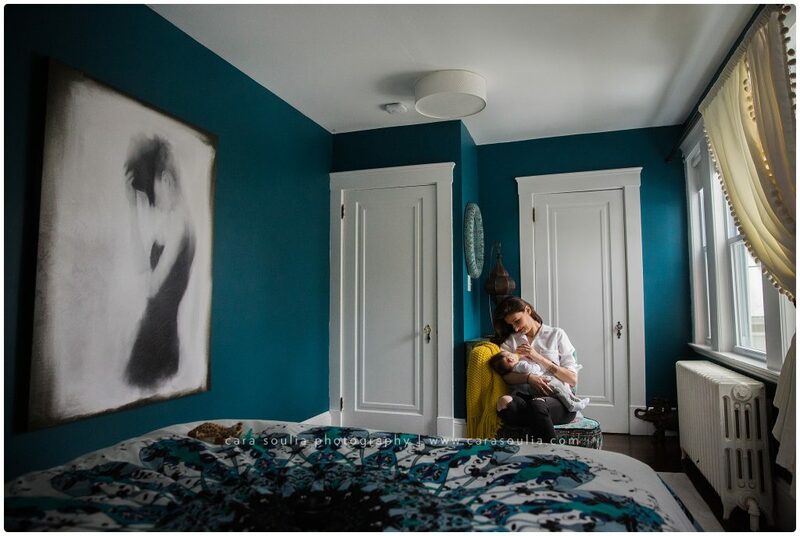 I love the thrill of not knowing what to expect when I open a client’s front door and then searching the location for beautiful light, color, lines and texture. 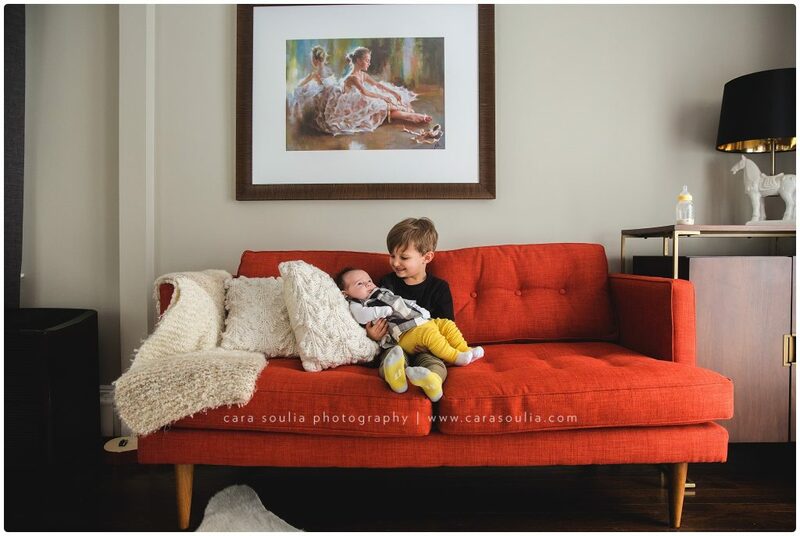 I thrive on the anticipation of what new treasures await me at each and every client home. 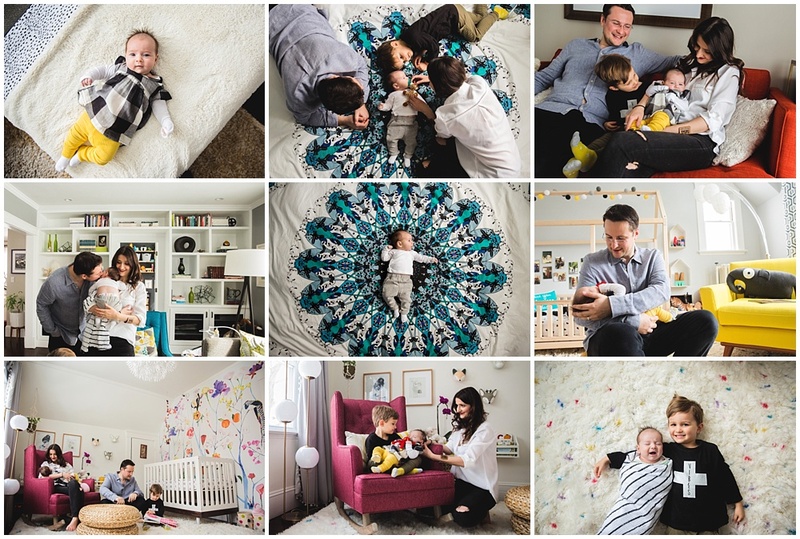 I can safely say that the treasures hidden behind this family’s front door were nothing short of amazing. 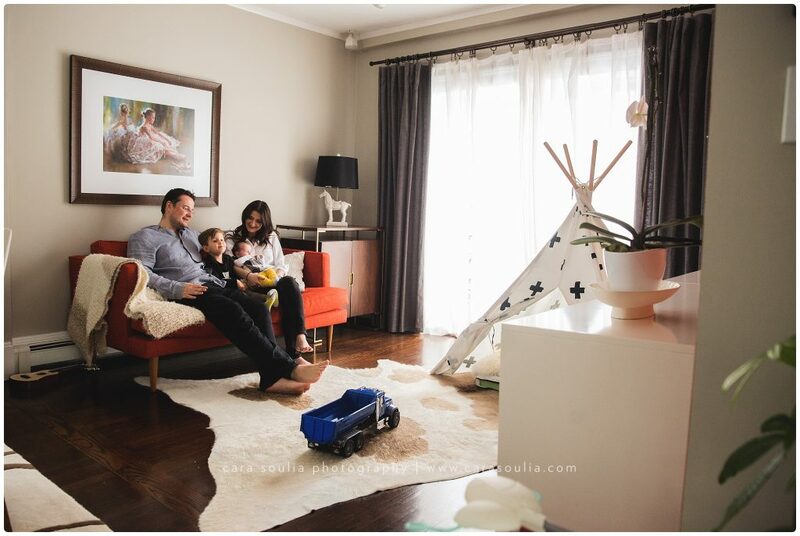 Not only was this family warm, welcoming and easy-going from the first hello, but the style and decor in this home were exquisite. 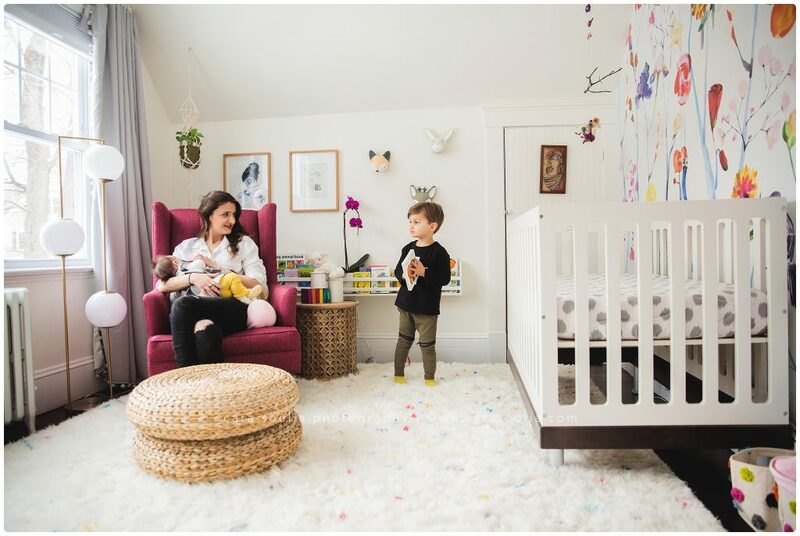 Every room was simply beautiful, with bright colors, fun patterns, cozy and inviting furniture and unique accessories. 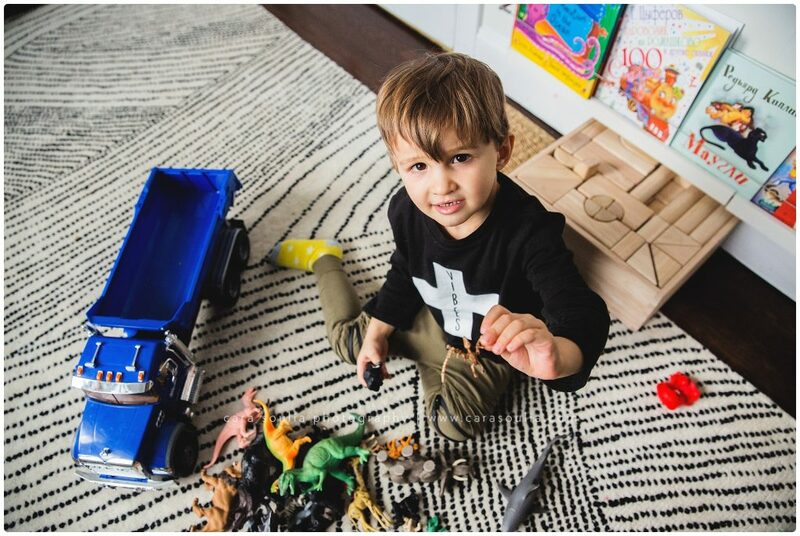 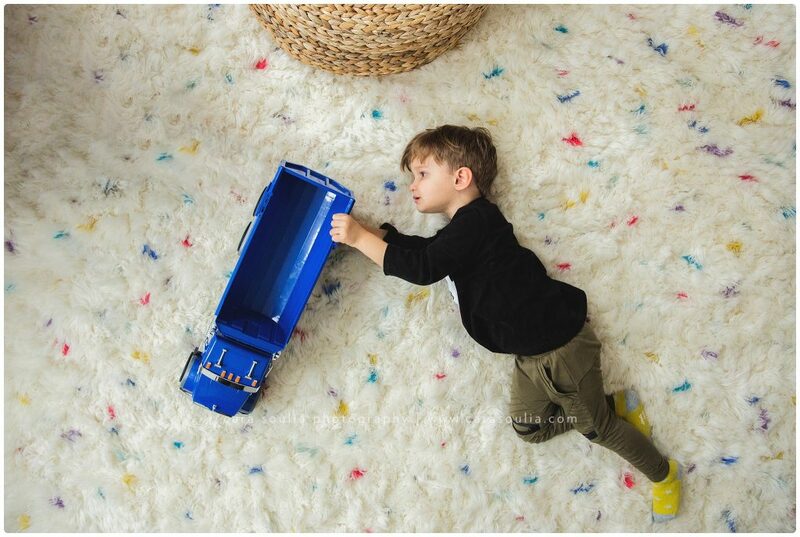 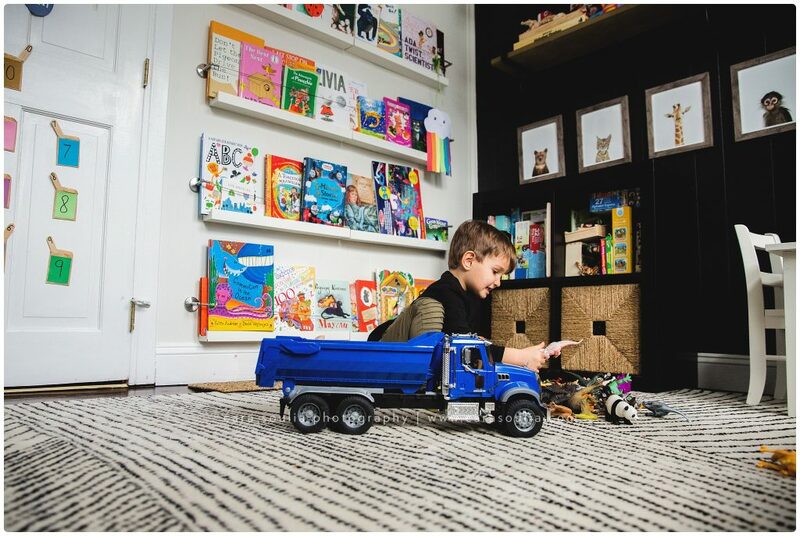 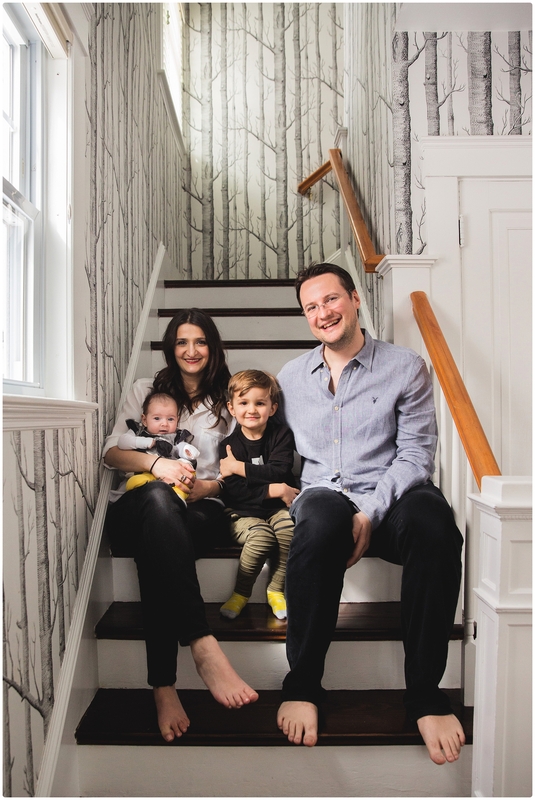 Every decorating decision was carefully thought out by Alisa Shakarian, who has an innate talent for interior design, and who also just happens to the be the mom in this family! 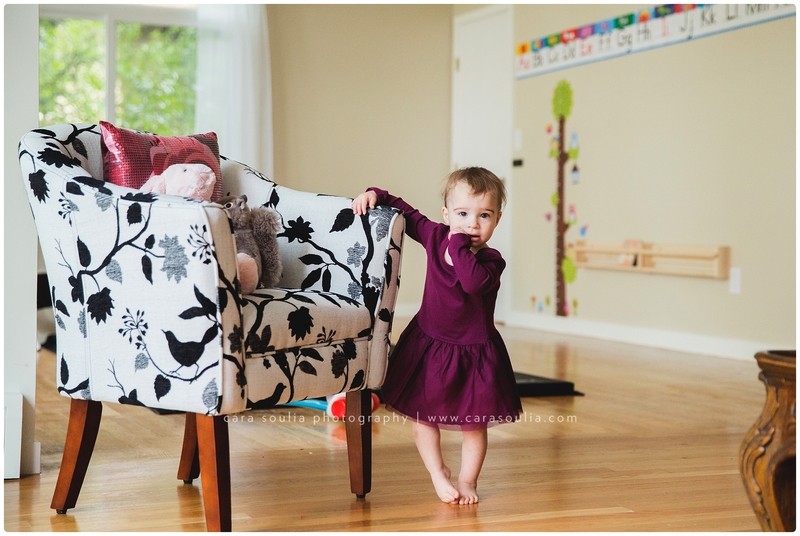 I am in awe of Alisa’s attention to detail and her ability to effortlessly make things look chic. 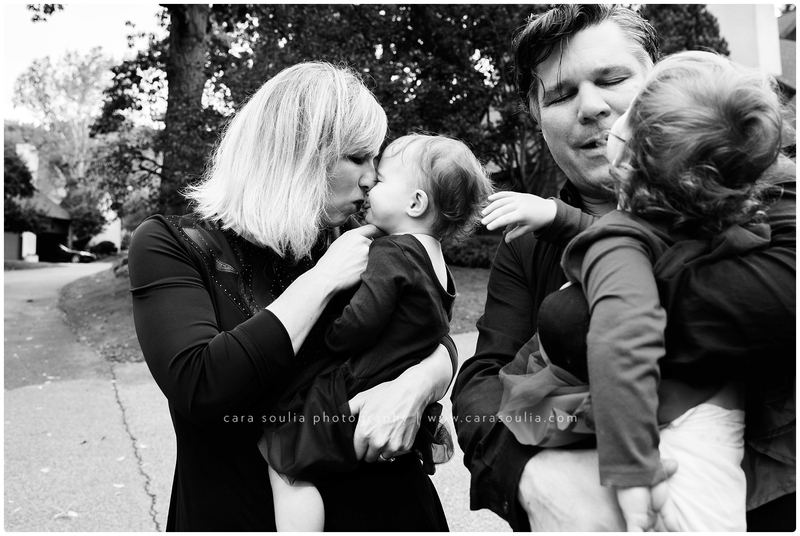 Here are the highlights from Alisa’s family session! 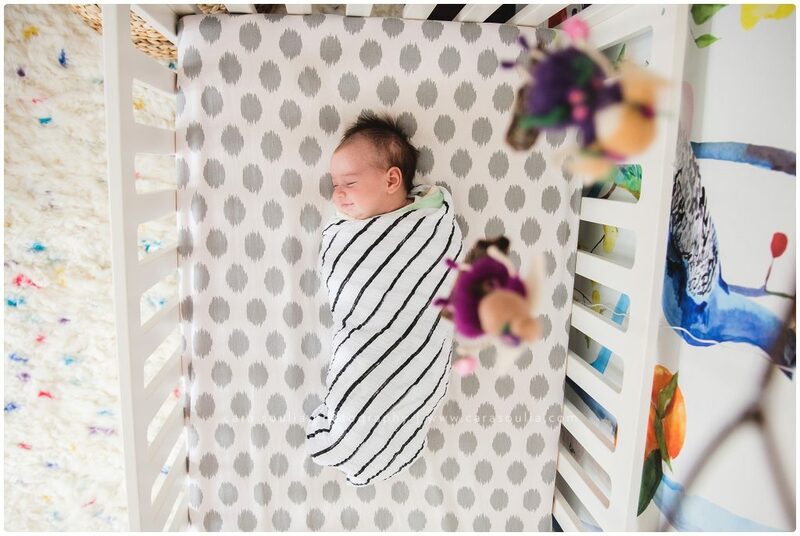 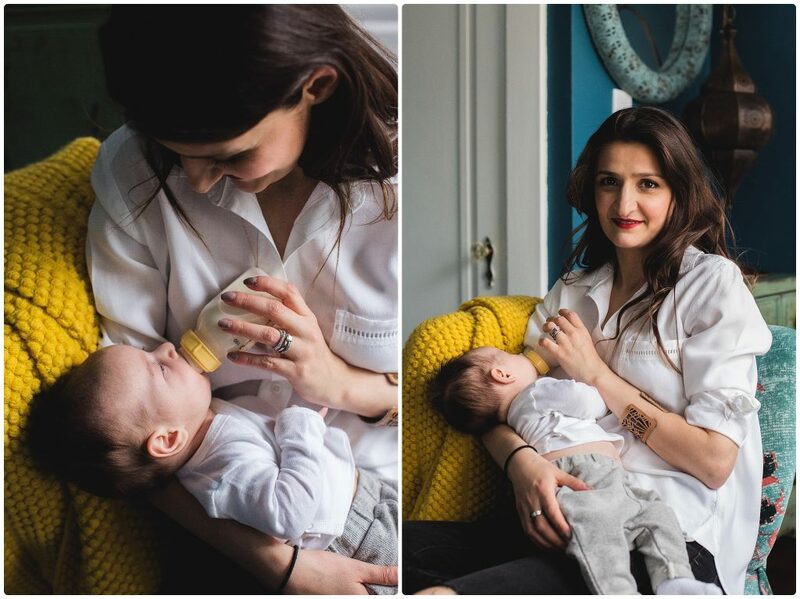 Her daughter had just turned 8 weeks old, which is such a great age for a photo session because there are plenty of opportunities to get both asleep and awake images of baby, as well as a high probability of capturing some sweet smiles. 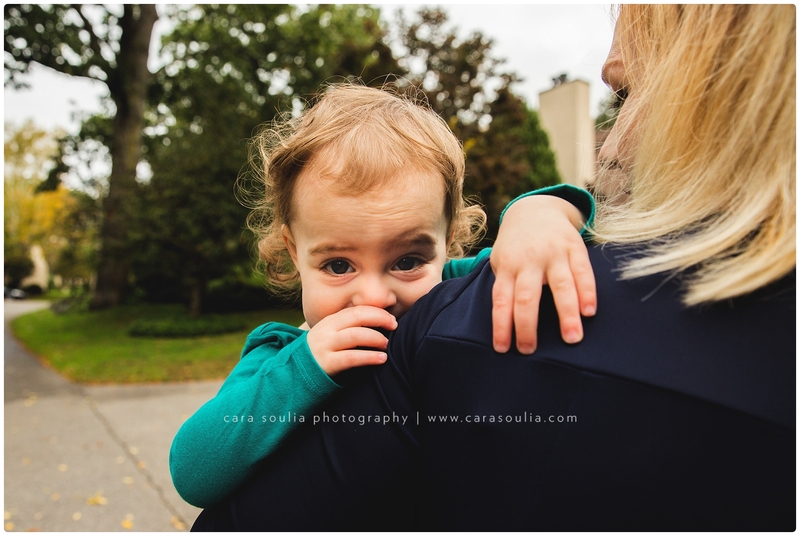 This was one of the times when I just happened to turn around, grab the shot and knew immediately it was going to be a keeper. 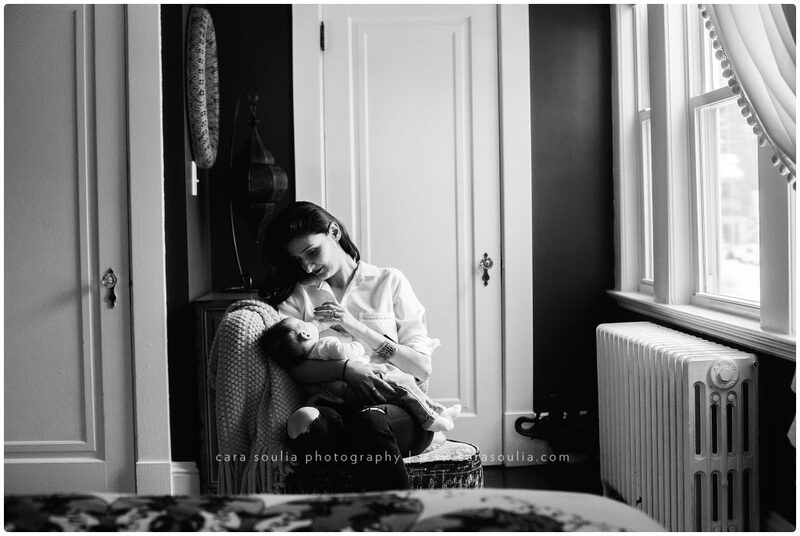 Baby in mom’s arms is so sweet, but how fantastic is that forest wallpaper?!! 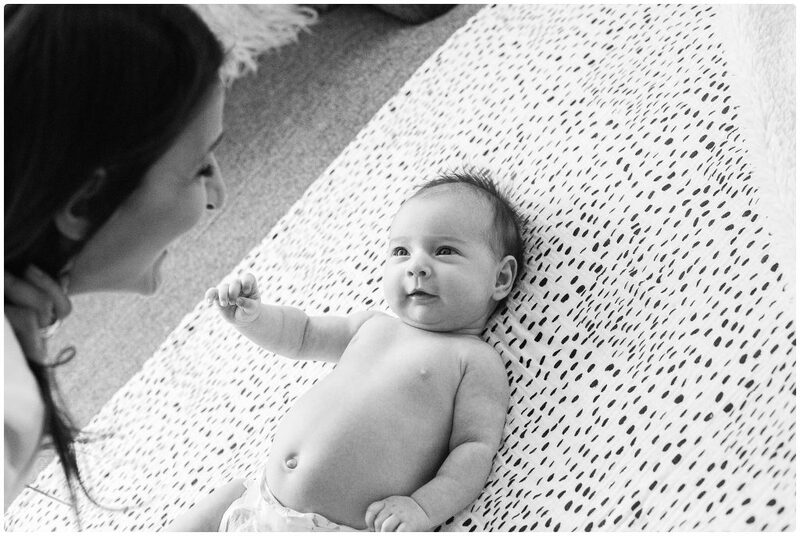 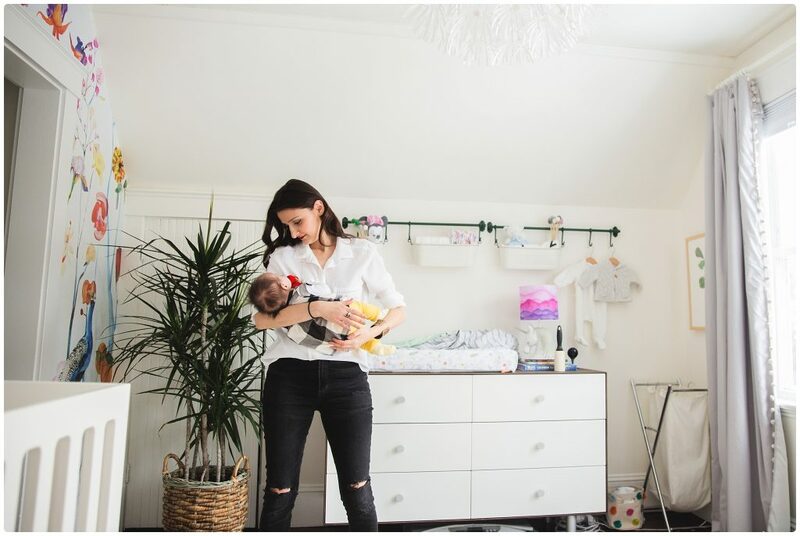 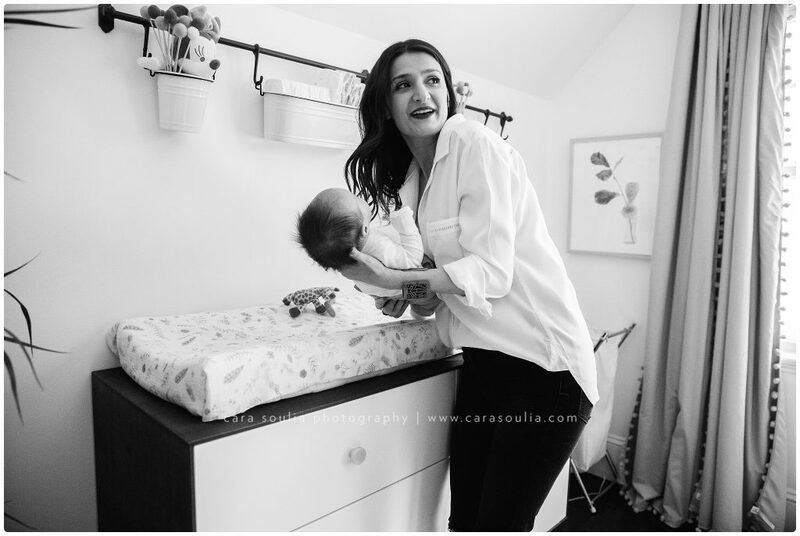 We started off the session in the nursery, which was full of gorgeous natural light. 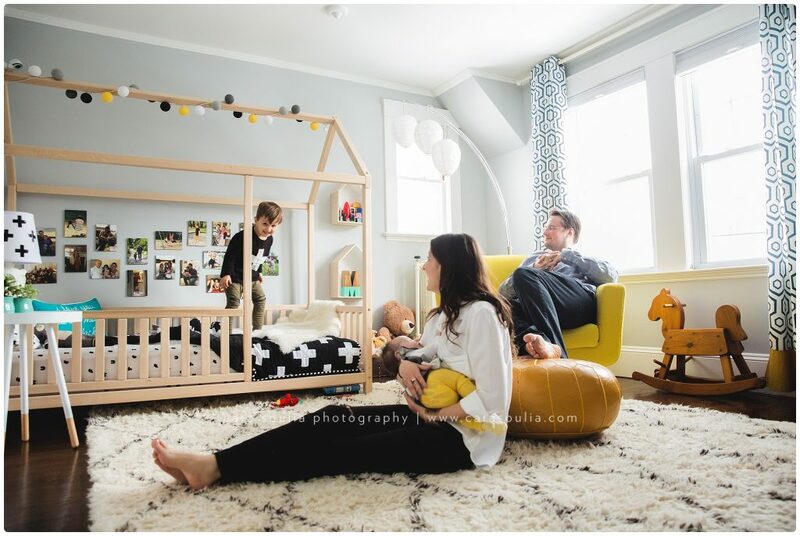 Everyone in the family is clearly comfortable hanging out in this cozy room..! 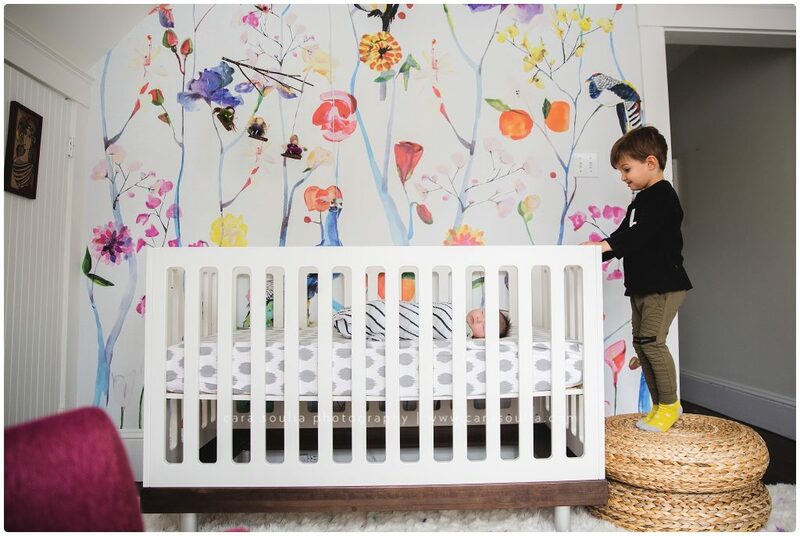 I can’t decide what I love more, the colorful wallpaper or the rug that reminds me of cake batter ice cream…! 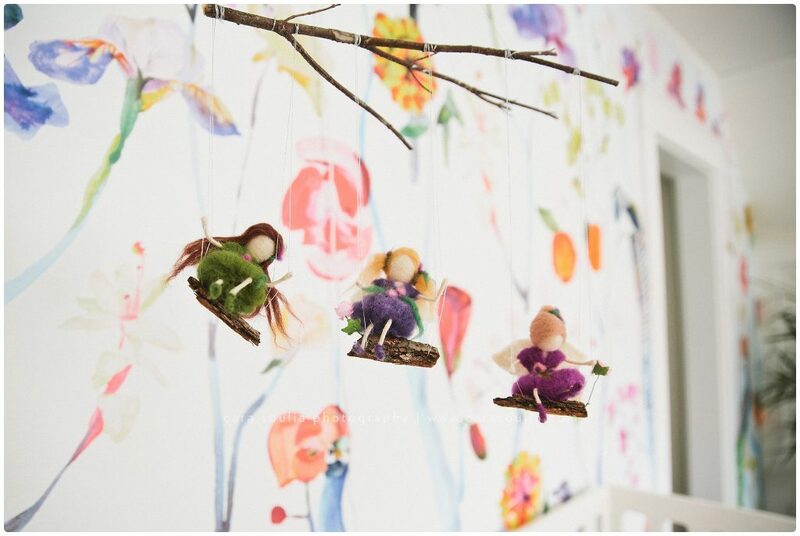 All little girls should have adorable fairies dancing above their cribs, don’t you think?? 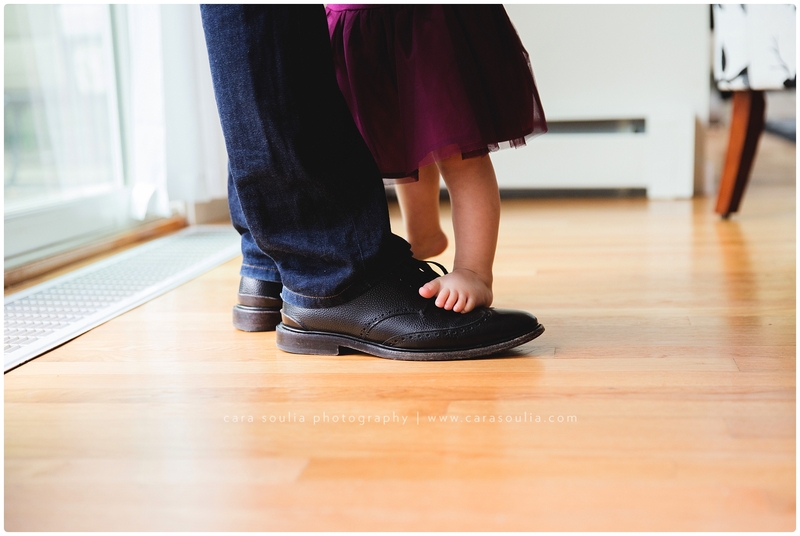 I love the look on his face… and the tiptoes!! 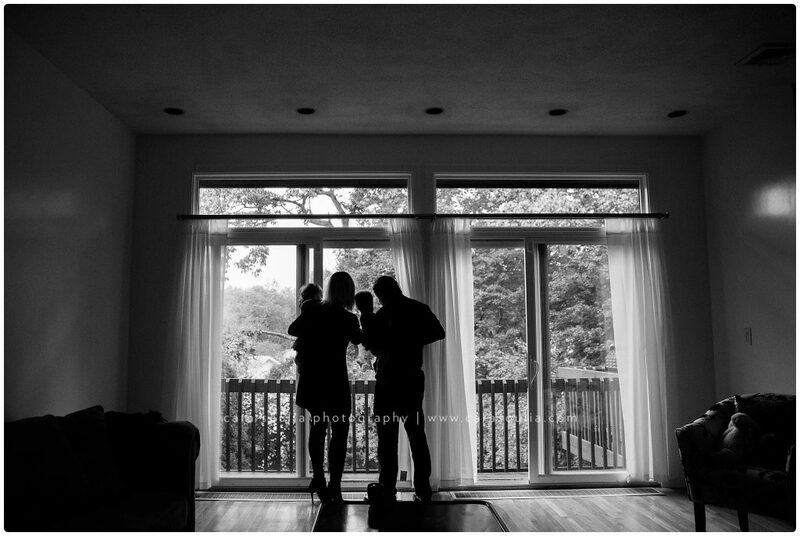 This is another favorite of mine. 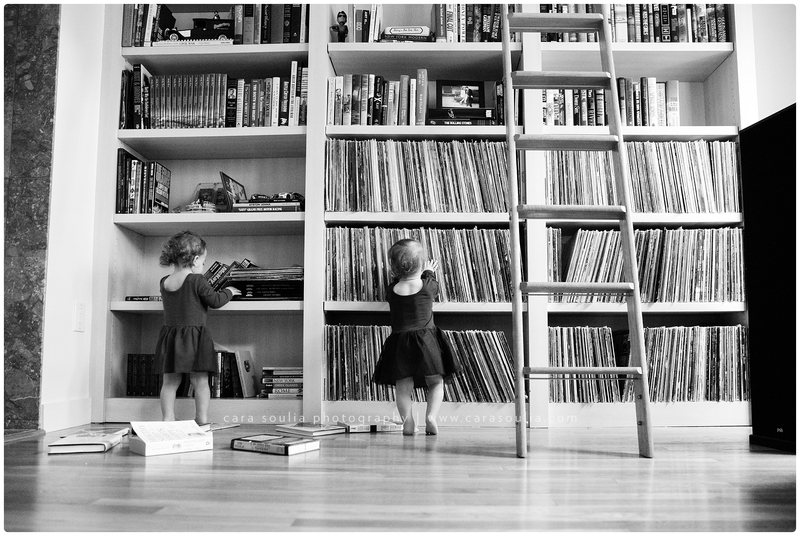 I love how timeless this image is in black & white…. 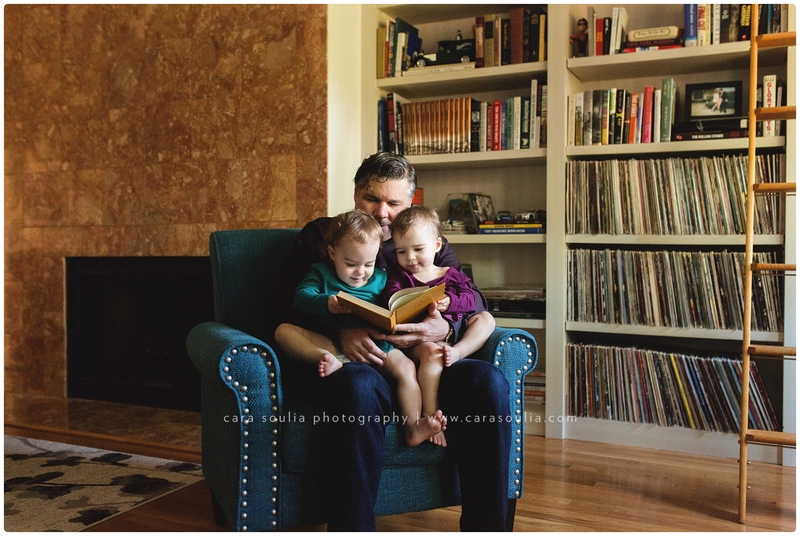 After a while we moved into big brother’s room for storytime with Dad…. 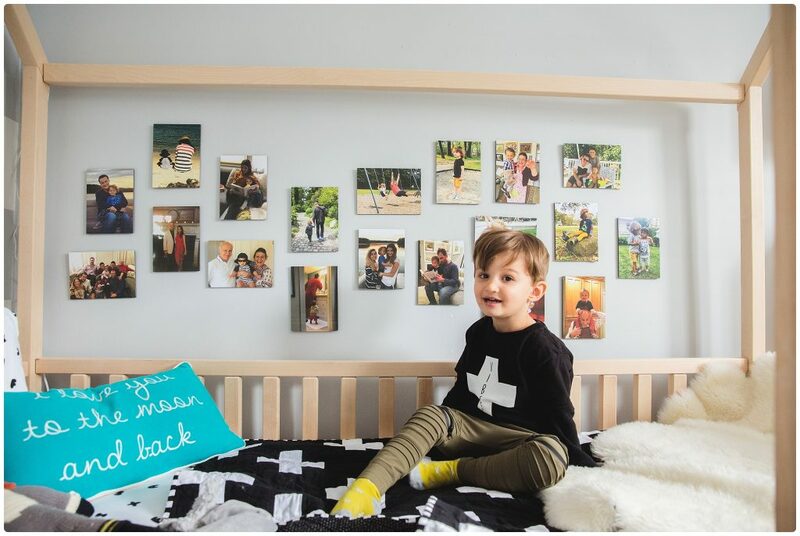 I love the collage of various family photos mounted on the wall. 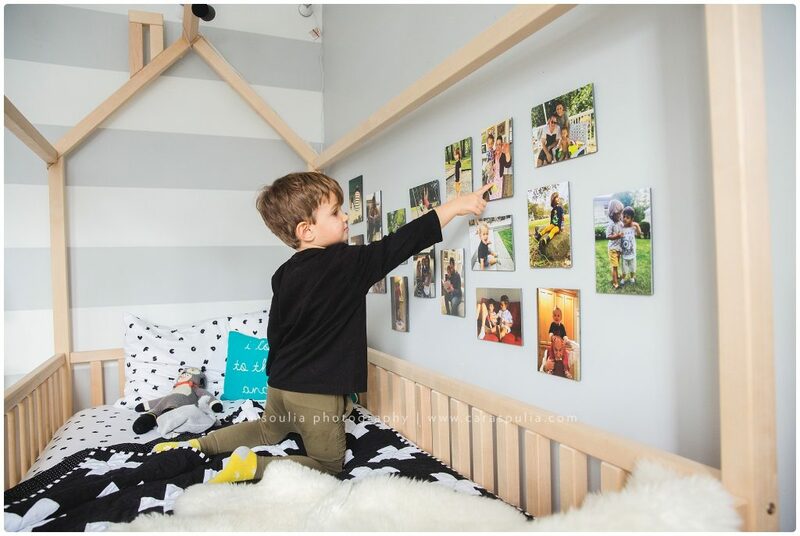 I think I might have to adopt this idea for my own children’s rooms! 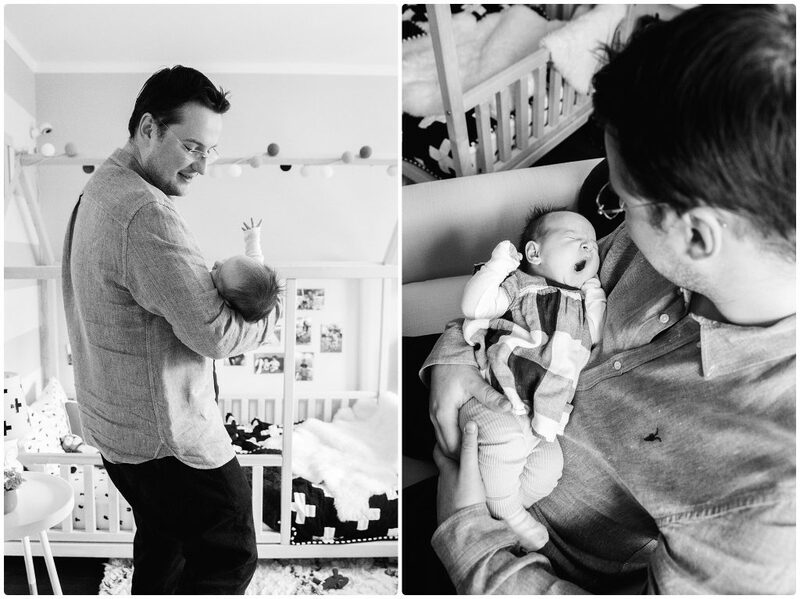 I think Dad is already pretty smitten with his little girl… Those fingers…..That yawn! 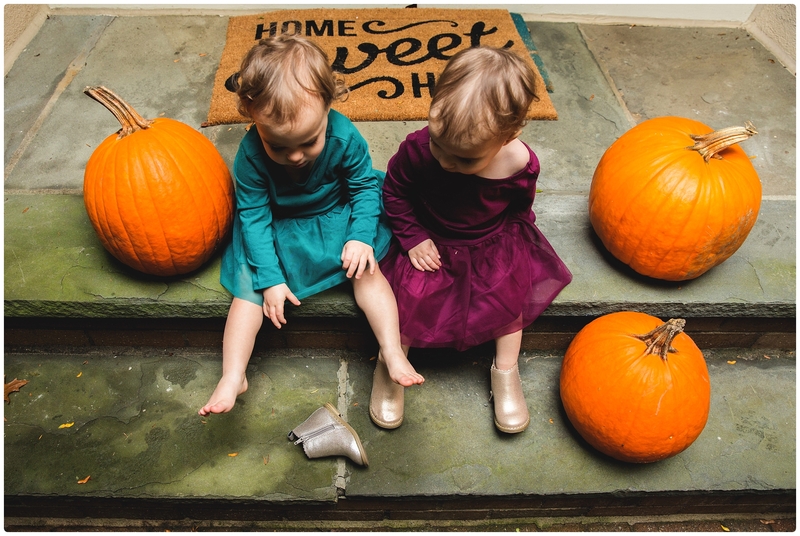 It’s all about the details…. 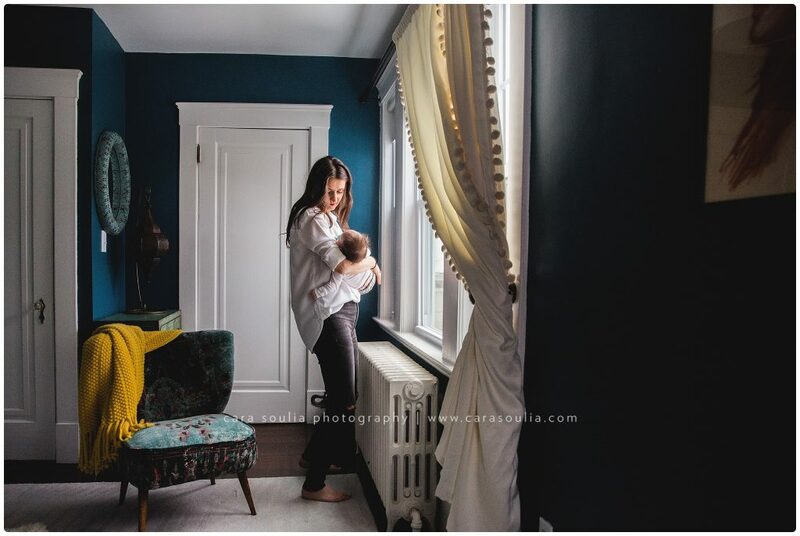 I couldn’t miss taking a few pictures in the family guest room where the walls were a deep beautiful turquoise and the lighting was low and moody.. my favorite kind of light! 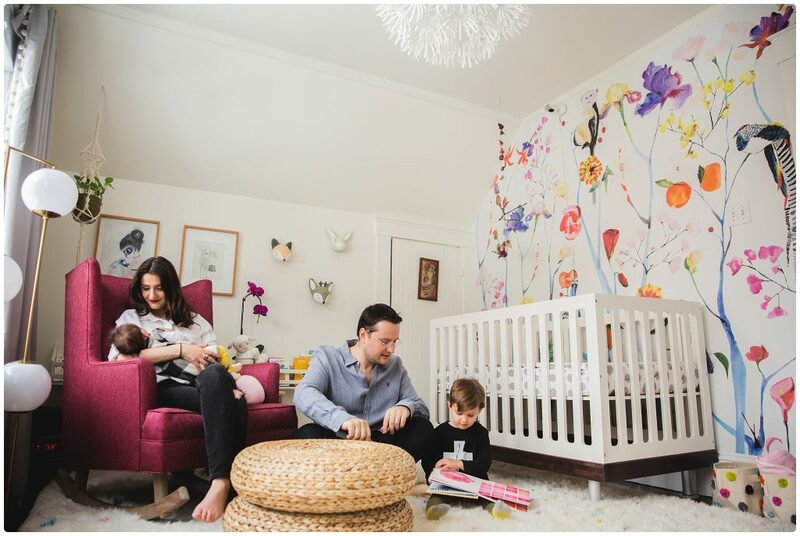 Alisa affectionately calls this her “hippie room”. 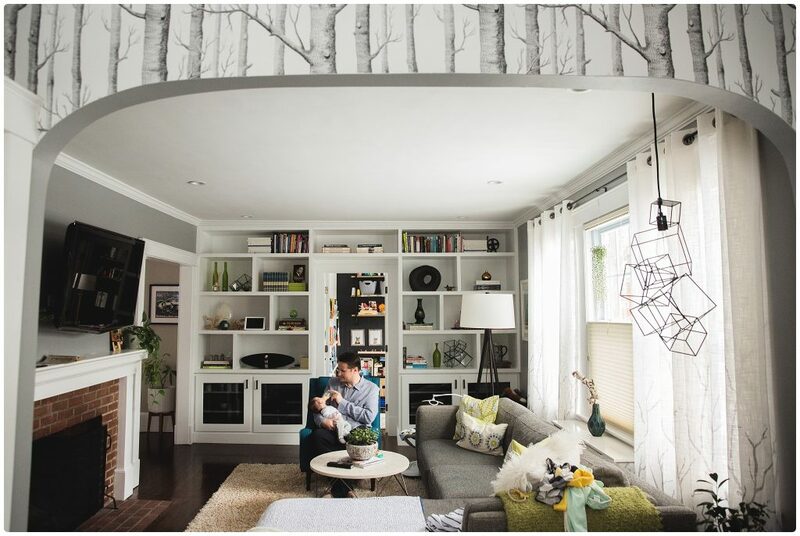 I would love to be a guest in this space anytime!! 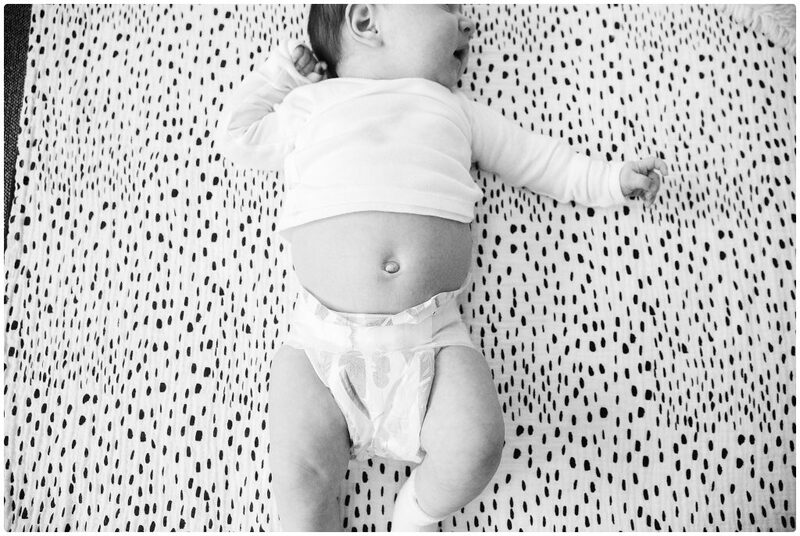 Newborn stretches are definitely in my top 10 of things I love about new babies… and belly buttons. 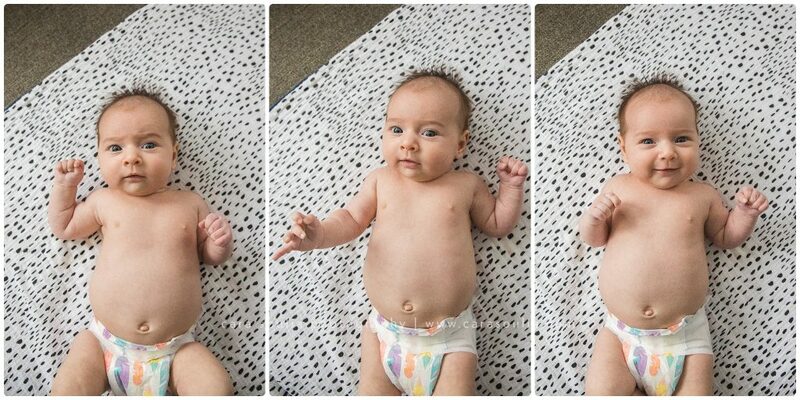 Can’t forget belly buttons… ! 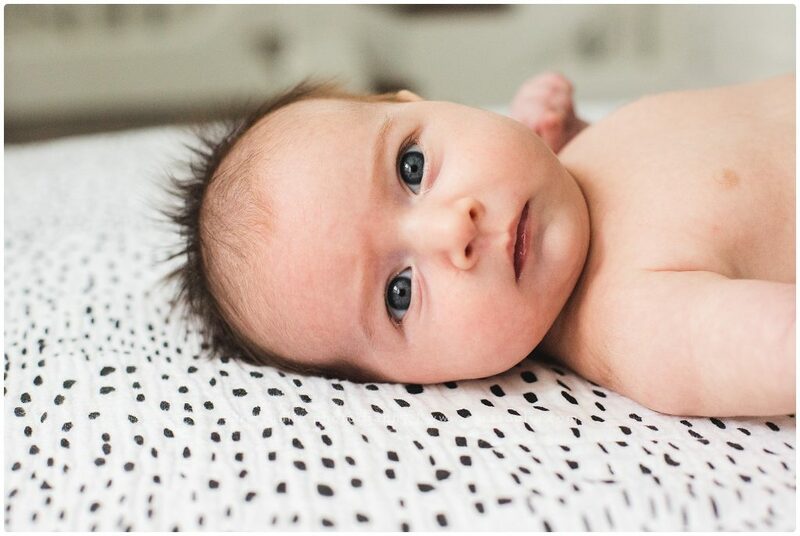 At 6-8 weeks all the cooing and smiling begins… Meanwhile in the other room…. 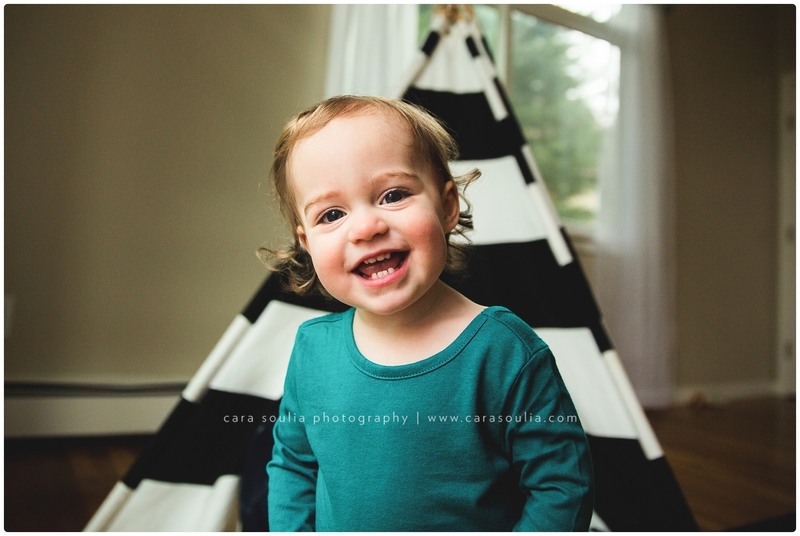 Just a few more portraits of this sweet face!! 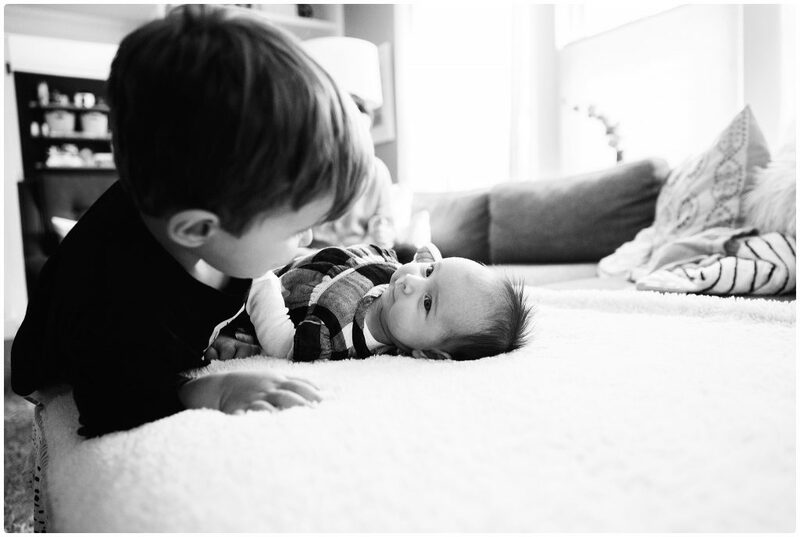 This is the beginning of a beautiful relationship…! 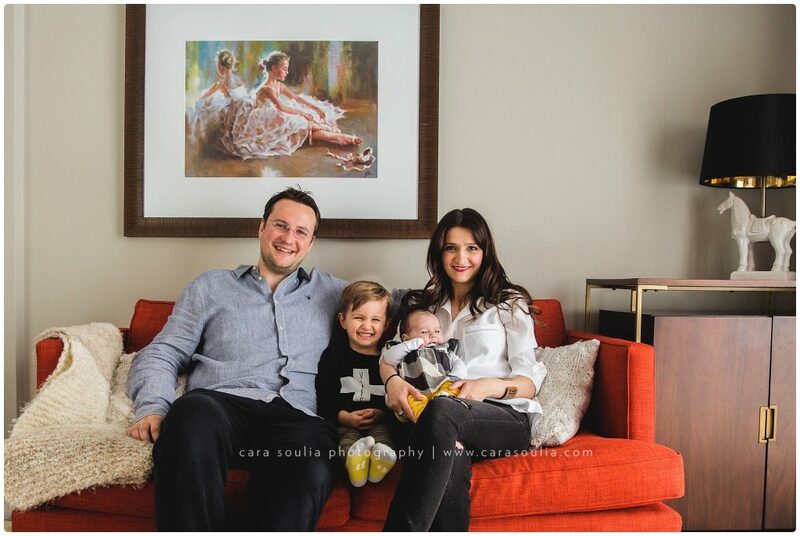 I couldn’t resist one last family picture in the ‘forest’….! 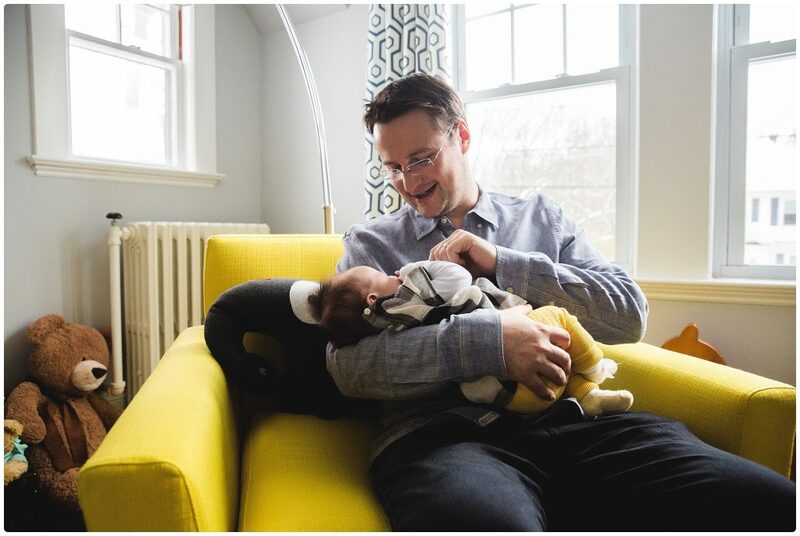 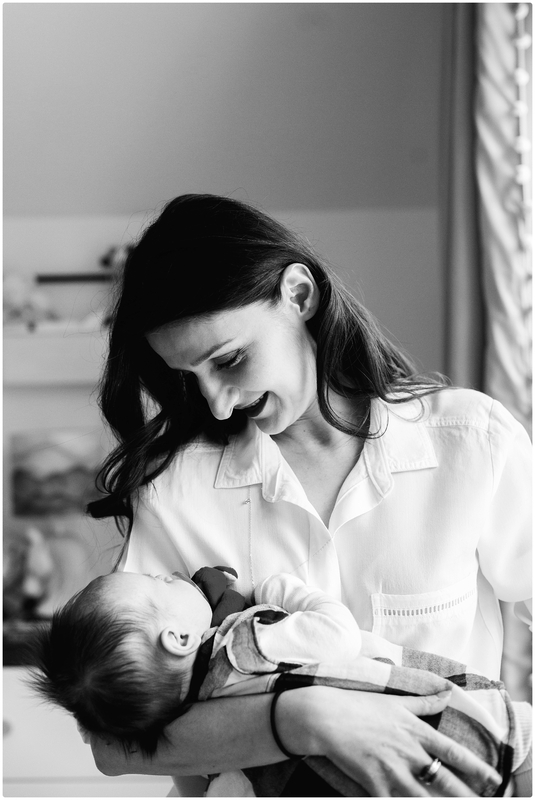 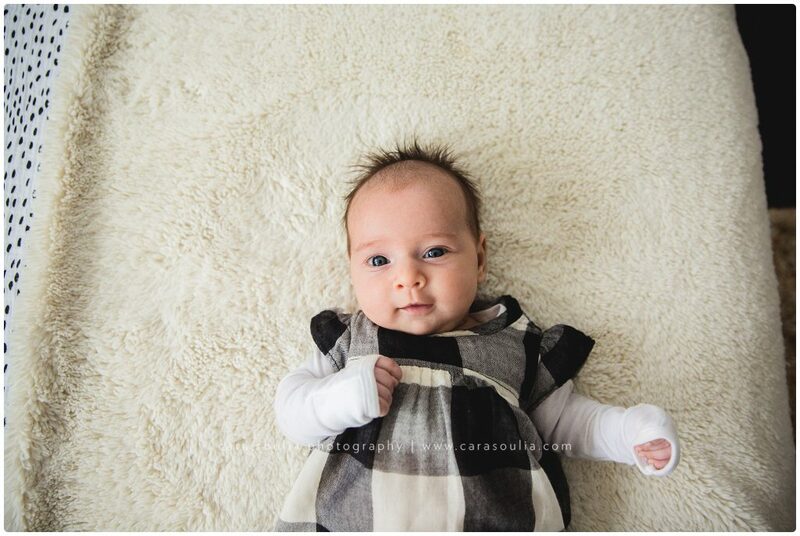 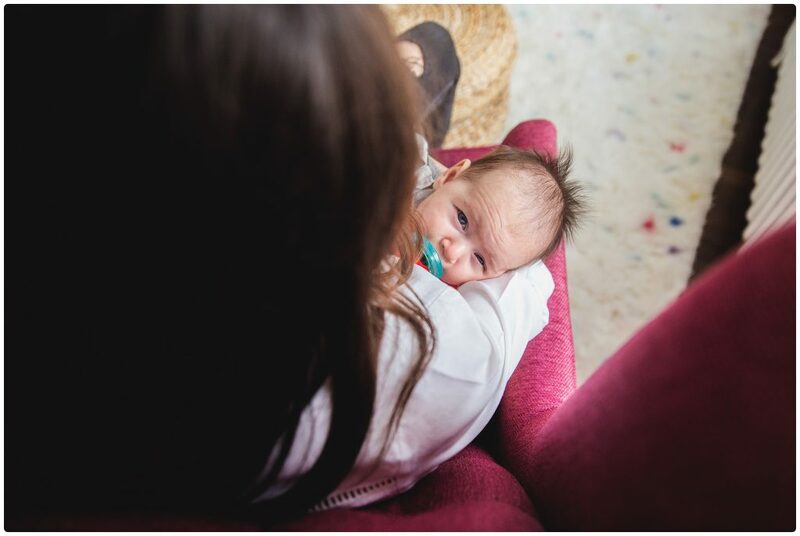 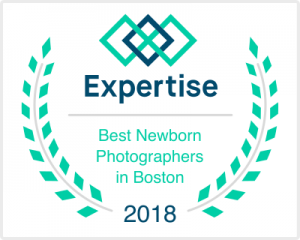 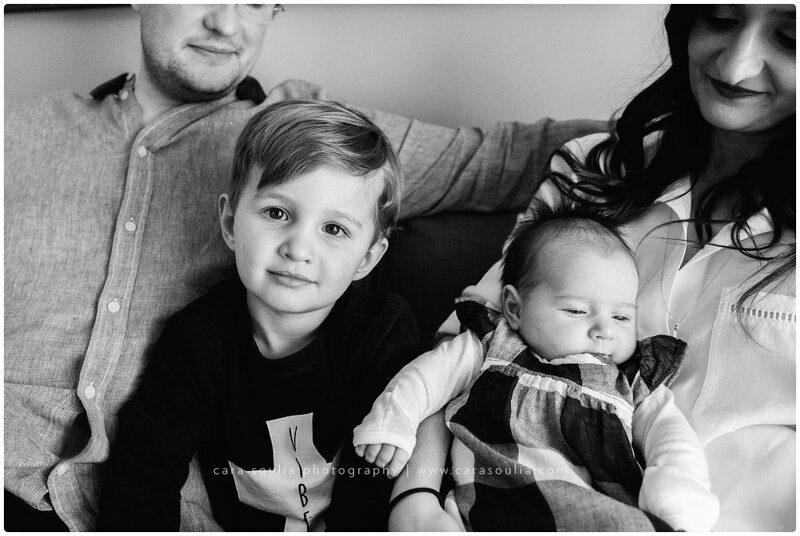 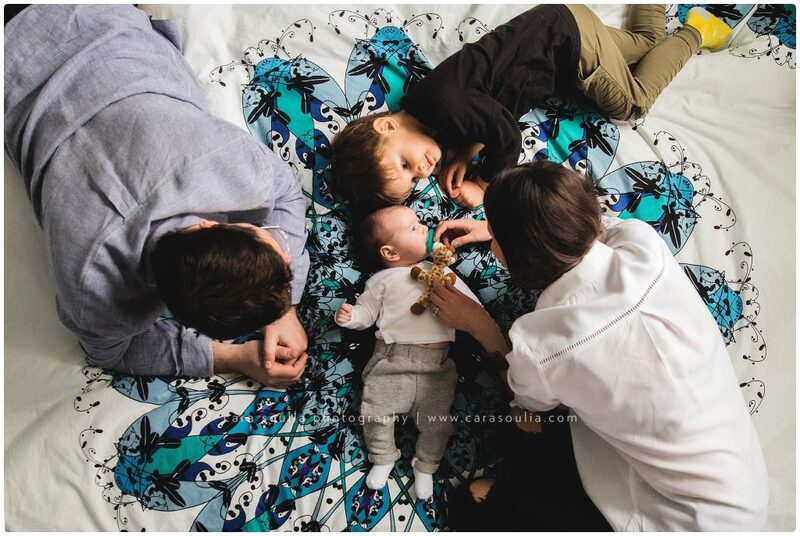 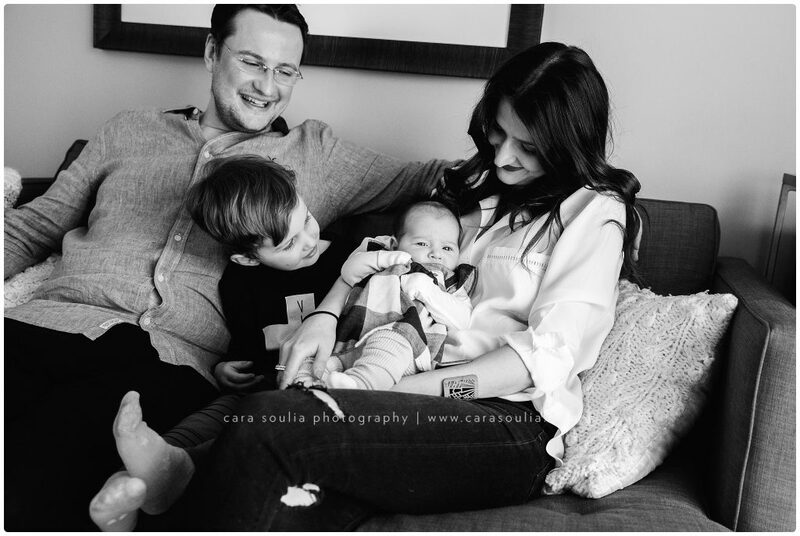 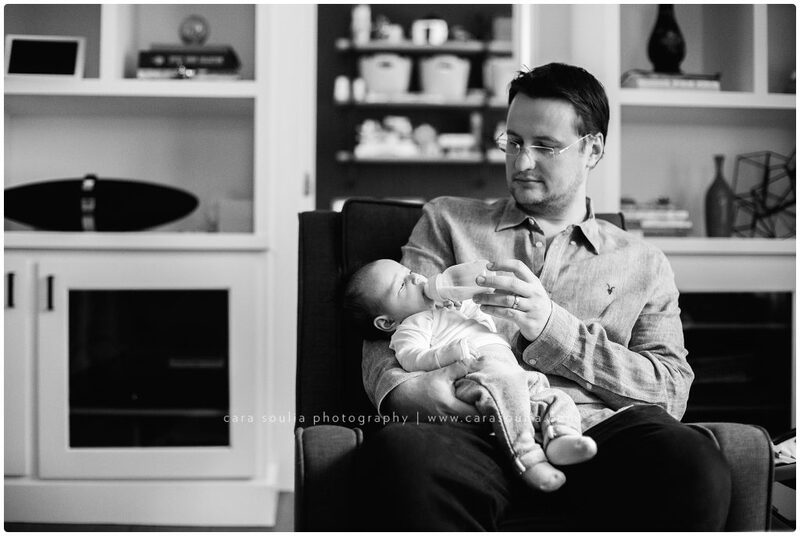 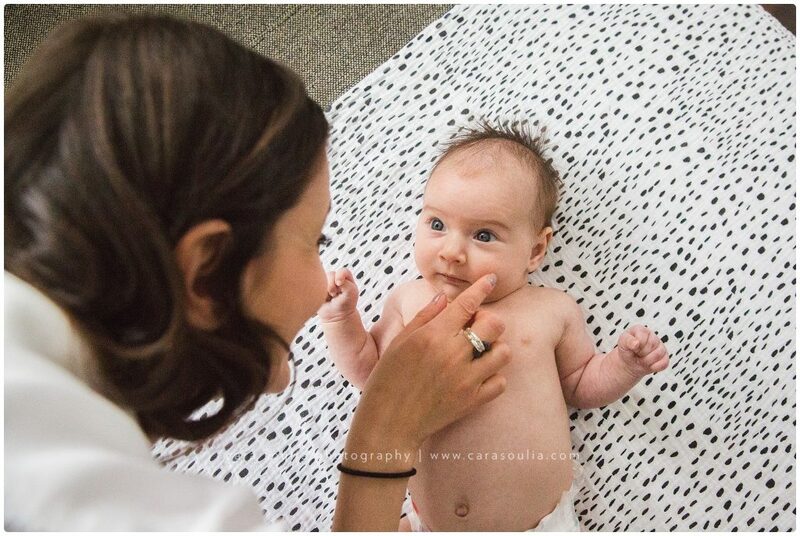 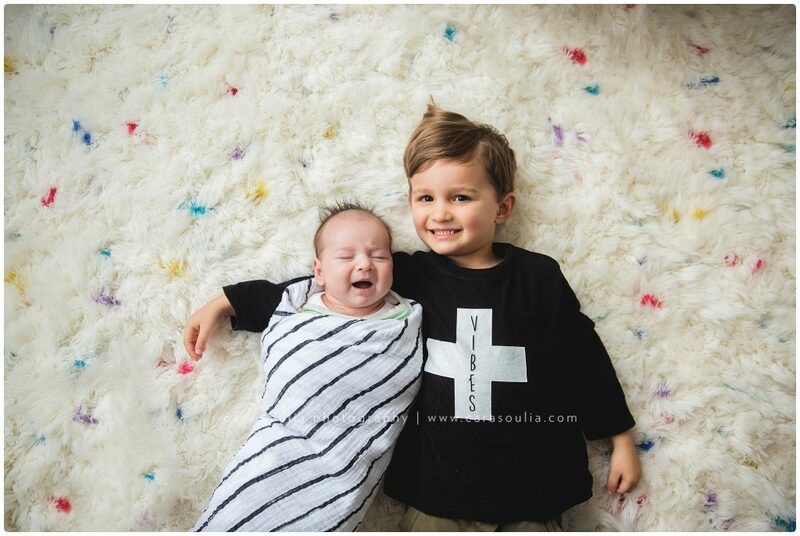 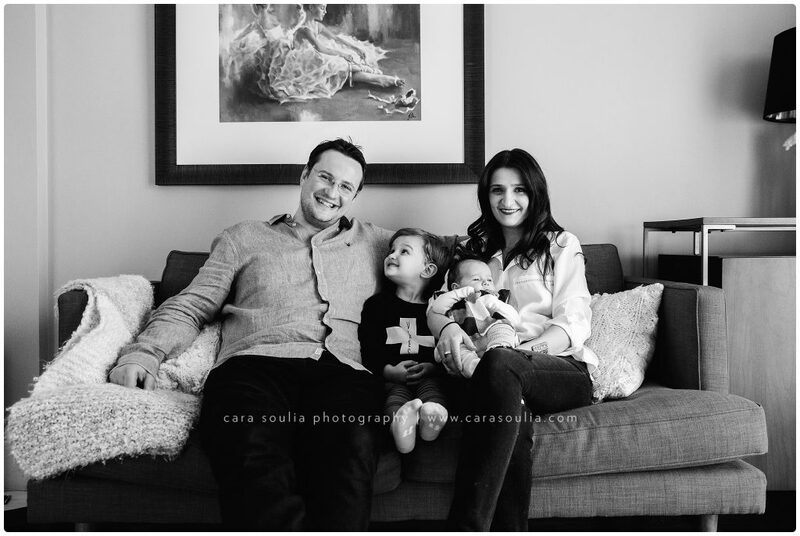 Cara Soulia is a Concord Massachusetts newborn photographer who specializes in capturing the most important moments in a family’s life in a beautiful and natural way. 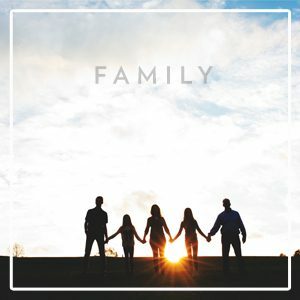 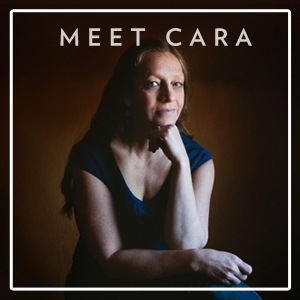 Cara has been a professional photographer for 8 years and has photographed hundreds of families over the years… Please get in touch with Cara to find out more about scheduling your family’s photo session! 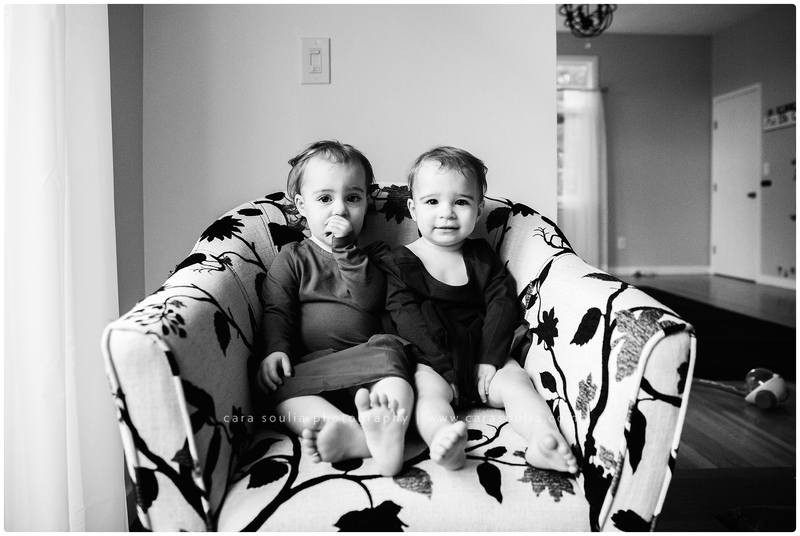 I always get really excited when I’m going to have a session with twins. 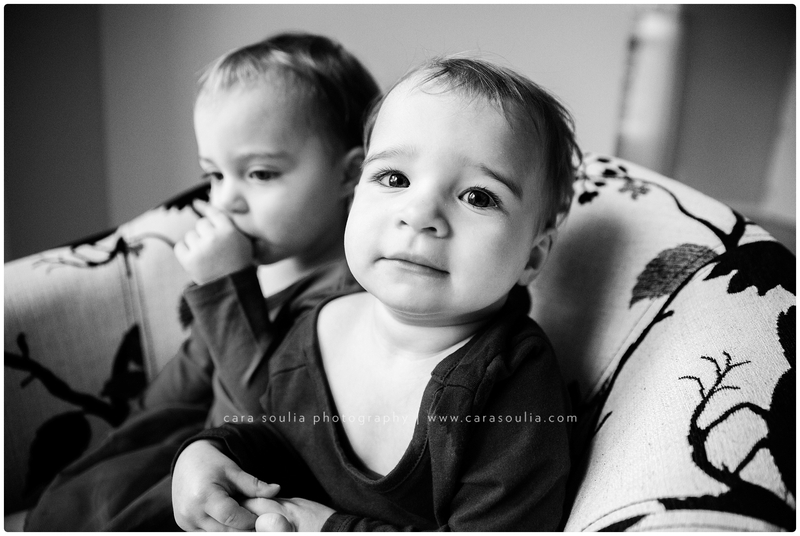 I guess I just find families with twins fascinating, since my husband is a fraternal twin and he and his brother could not be more opposite. 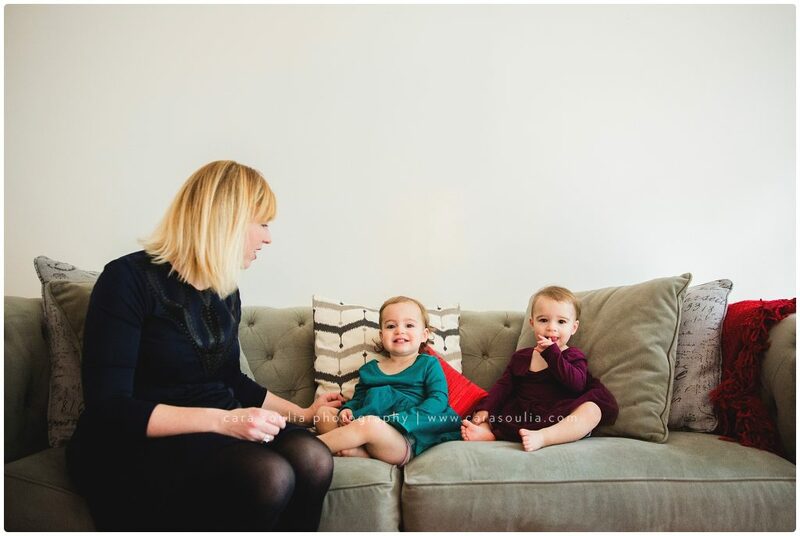 And I find that this is usually the case with the personalities of twins — one is always a bit more daring, the other a bit more shy, one is more serious, the other more silly. 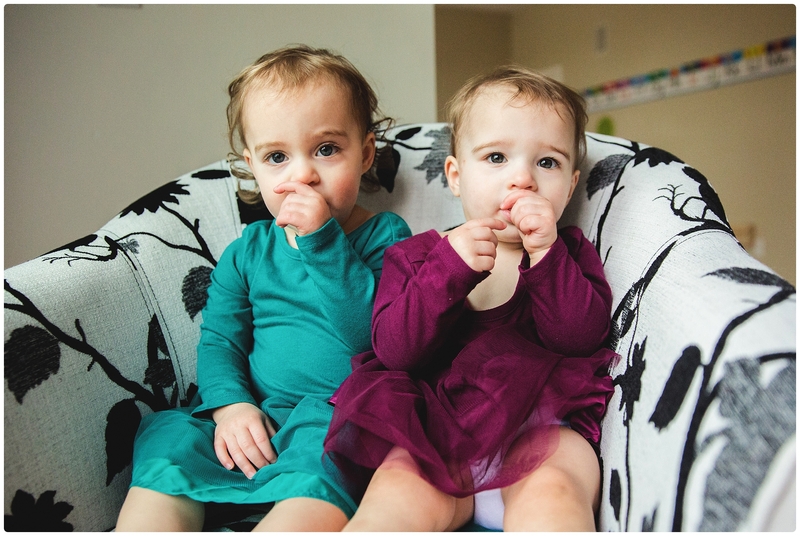 It’s like they split the personality traits right down the middle when they are in the womb! 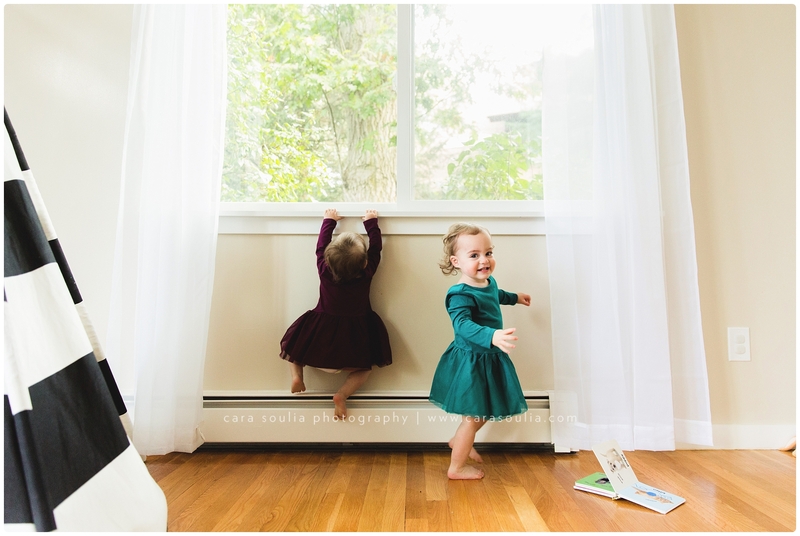 Katie and Madison were no exception to this rule — Katie (in turquoise) was a bit more reserved when I first arrived, while Maddie (in purple) went right to work showing me all the toys, dancing on dad’s feet, climbing the walls (literally!) 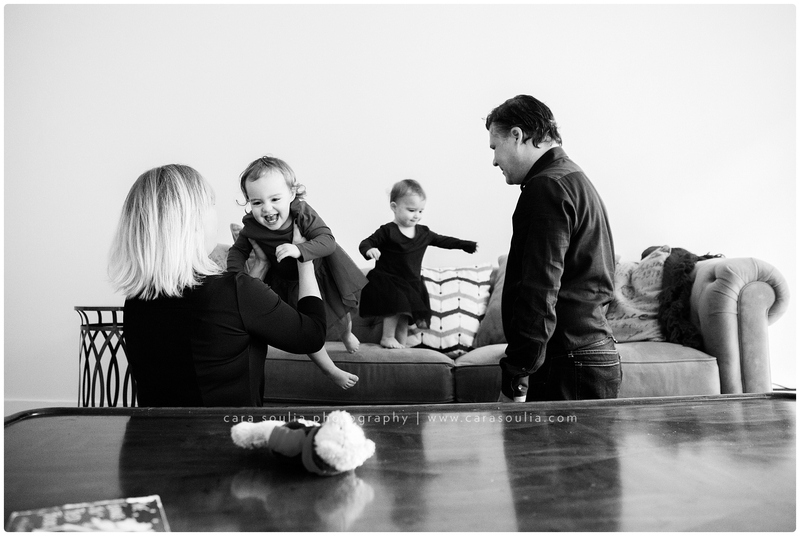 and jumping off the sofa! 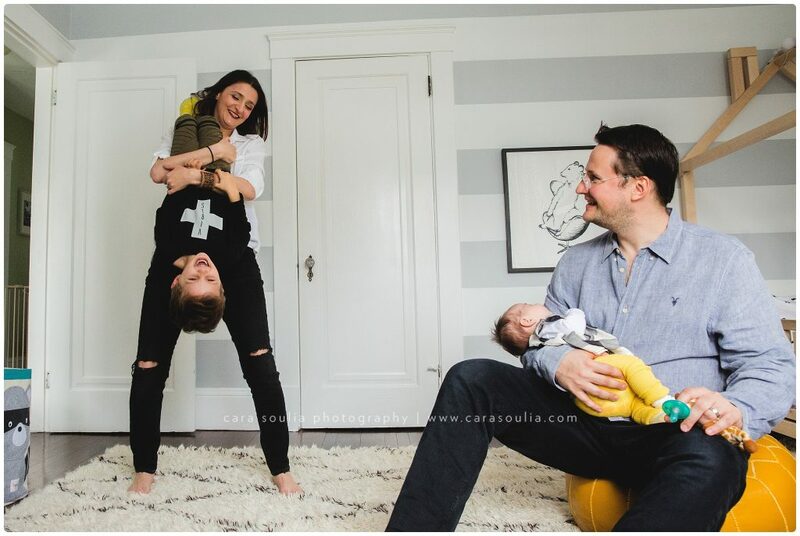 This mom and dad sure do have their hands full with two under two, but they truly made it look easy. 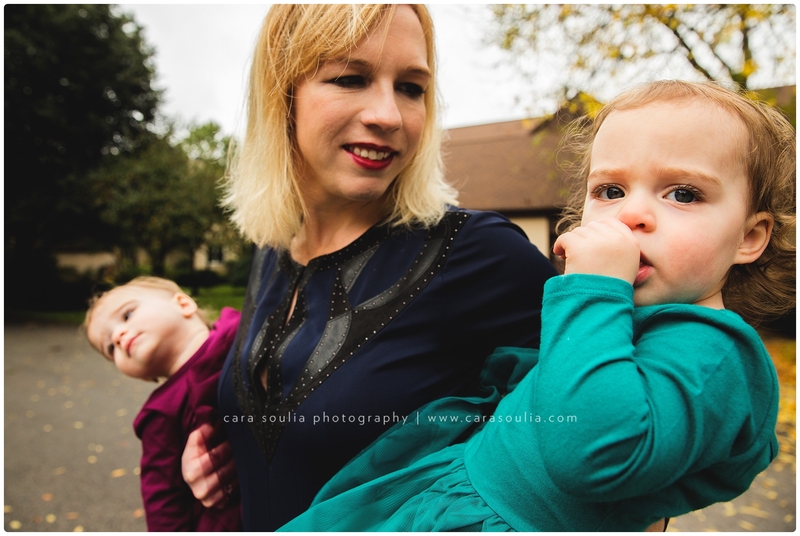 Who needs to workout when you have these two to carry around!? 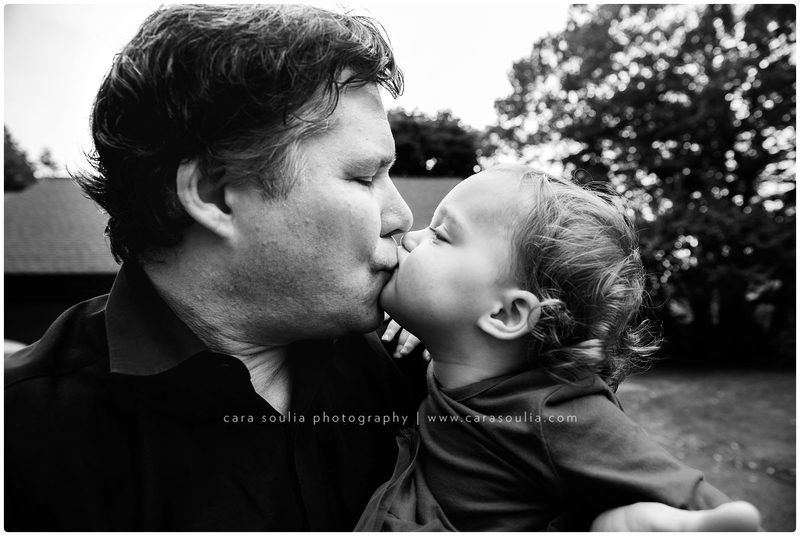 All great photo sessions end with kisses… ! 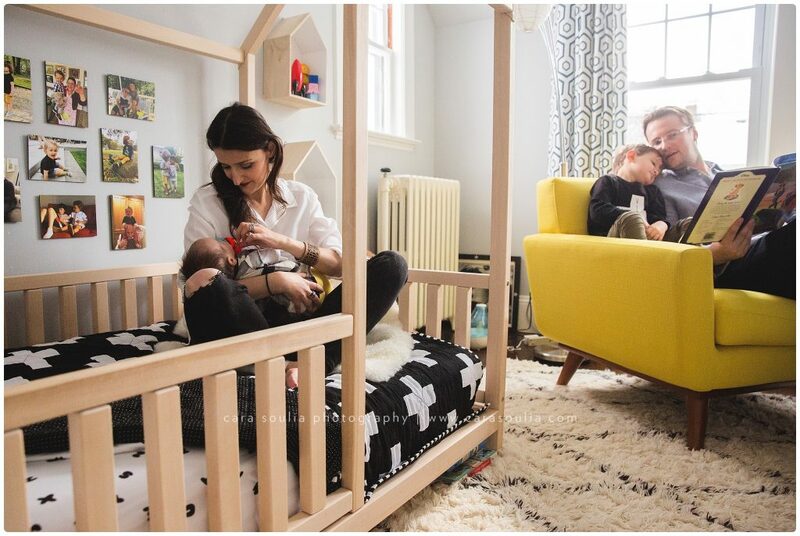 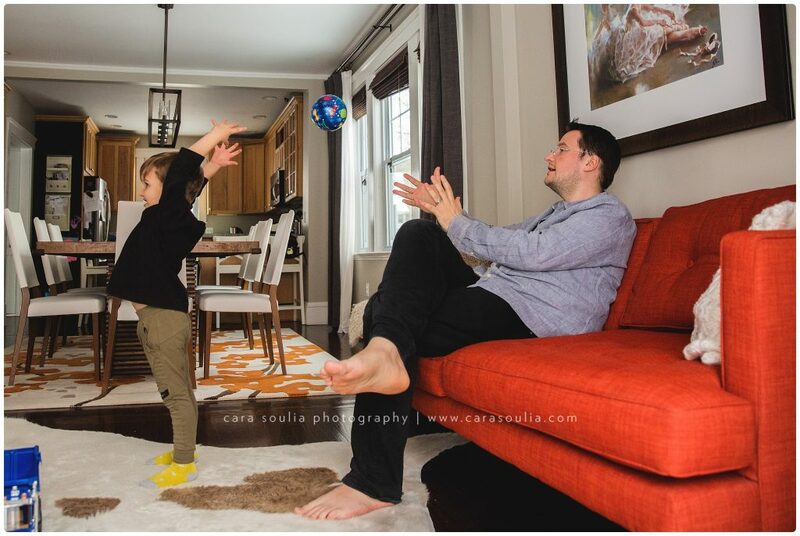 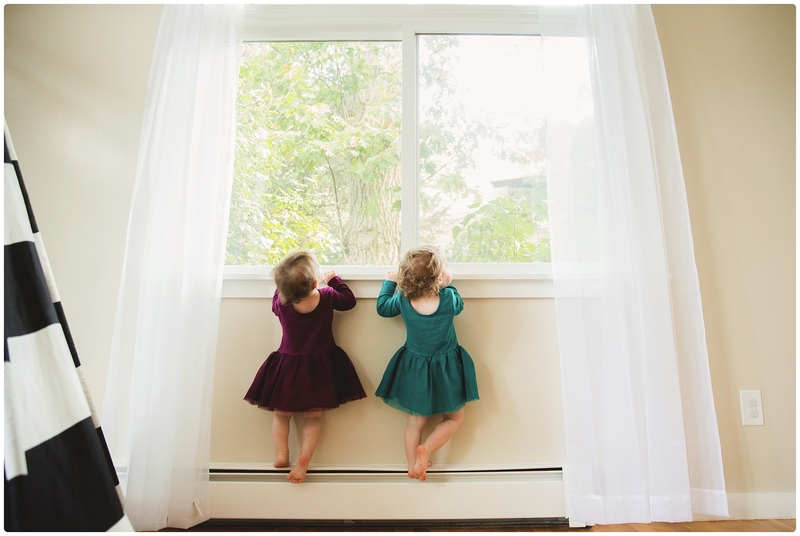 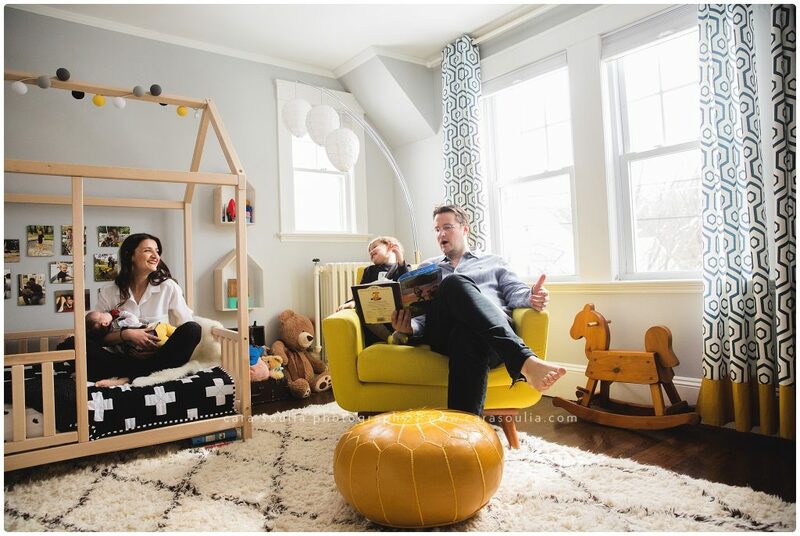 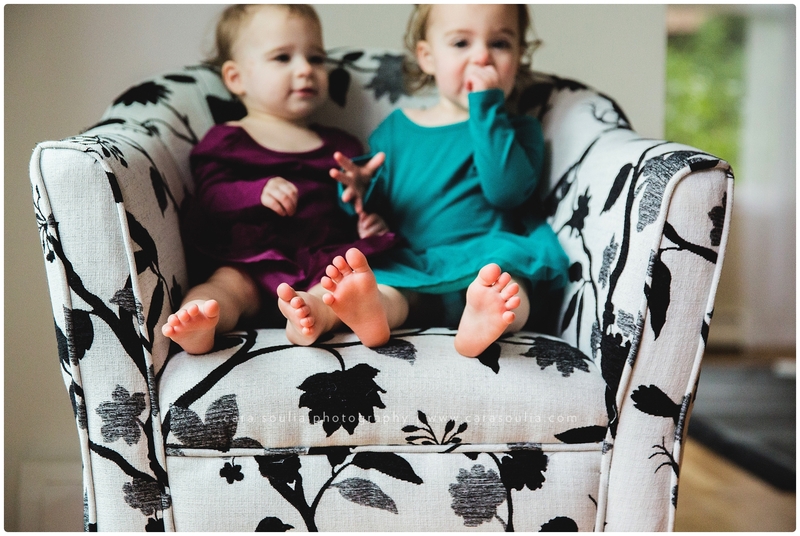 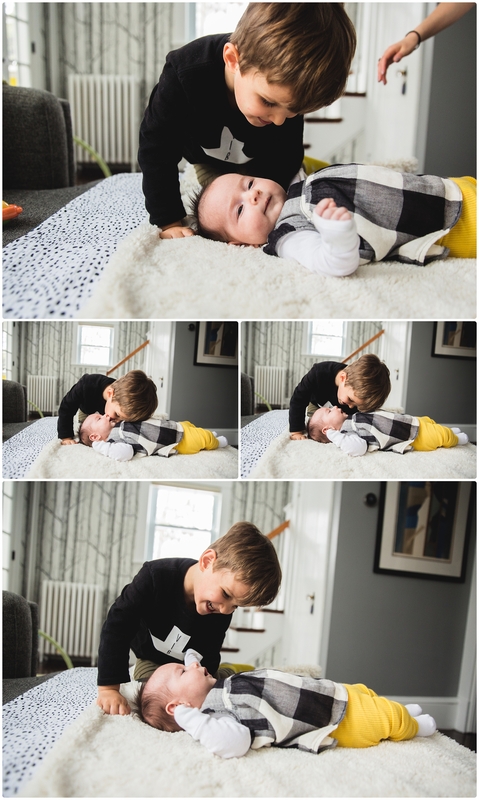 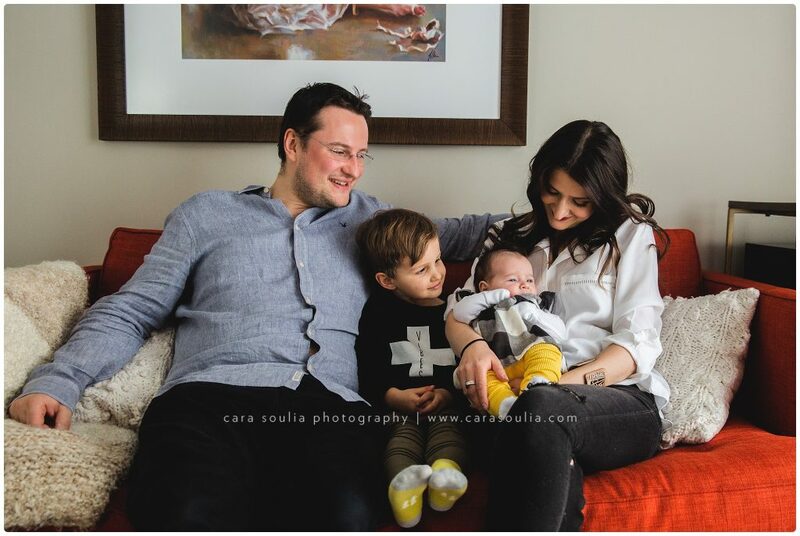 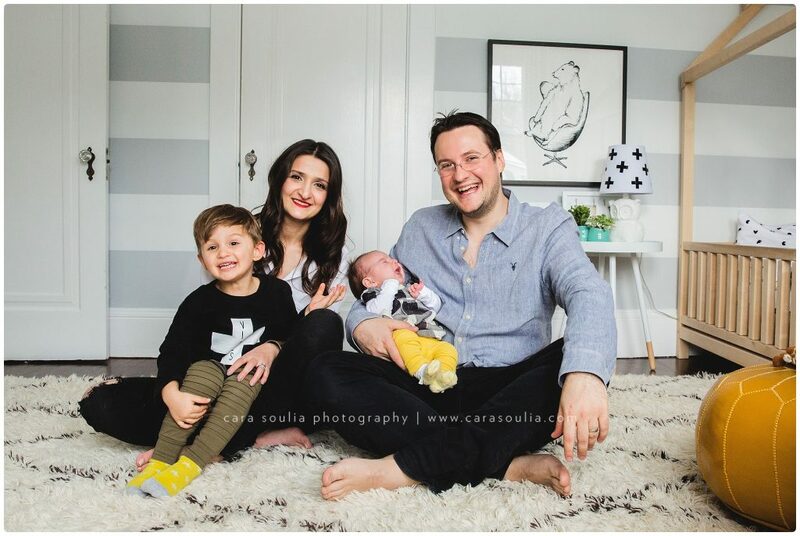 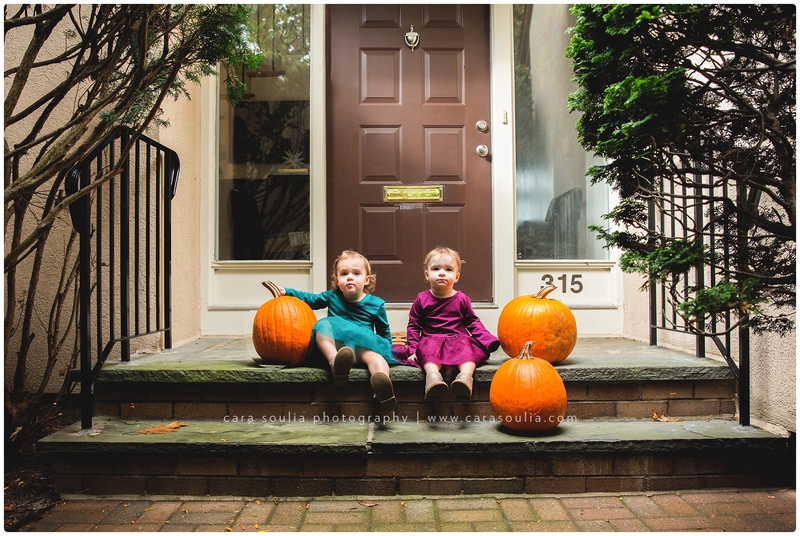 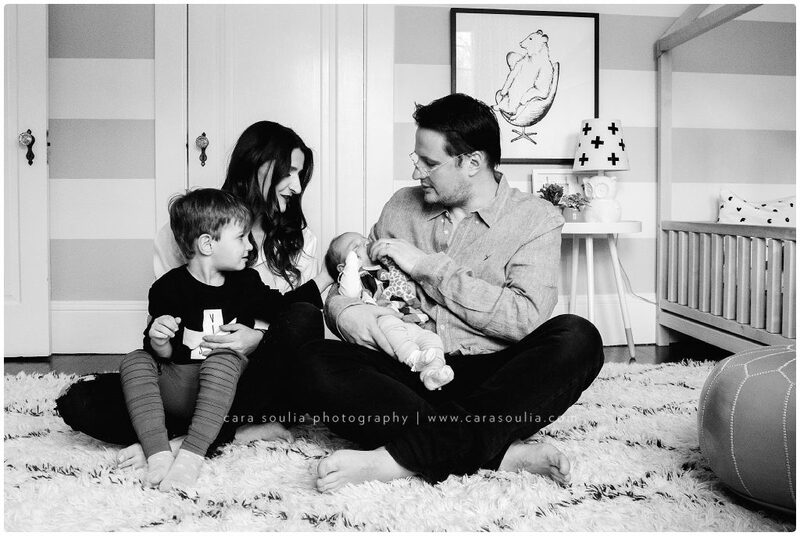 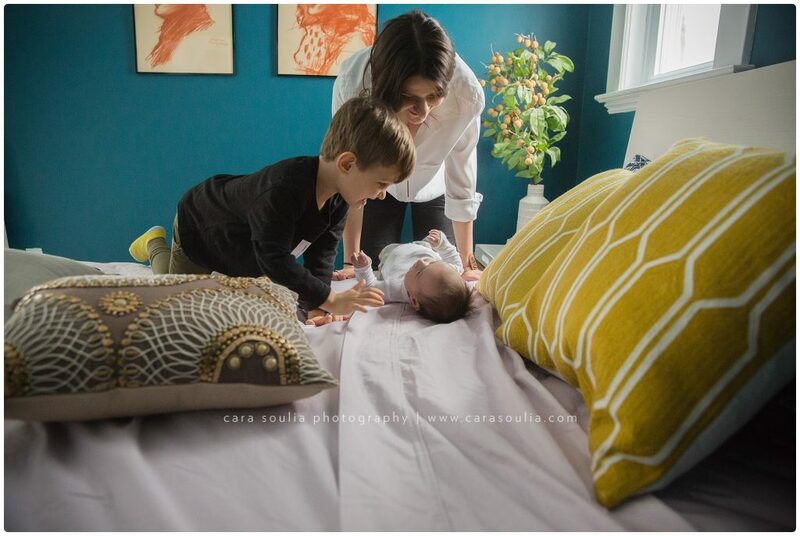 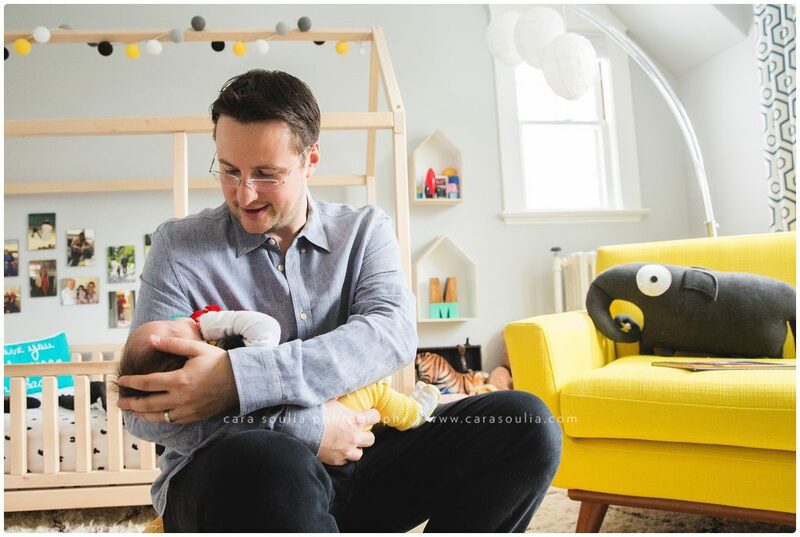 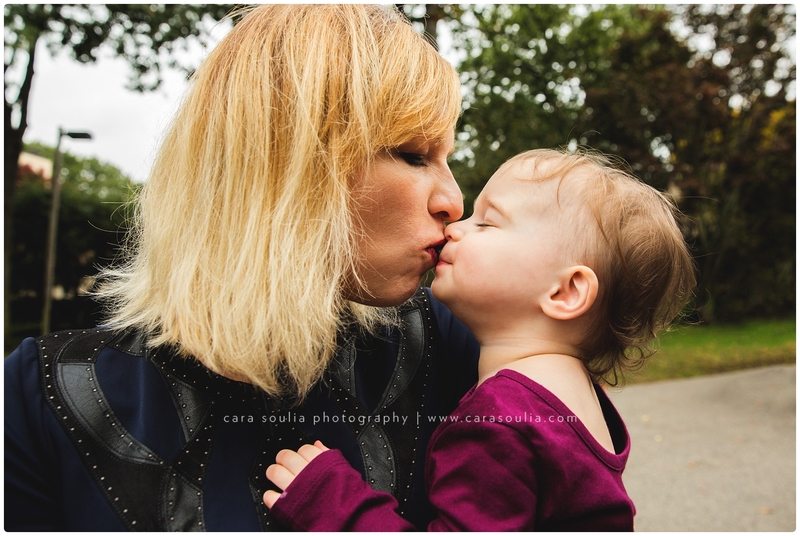 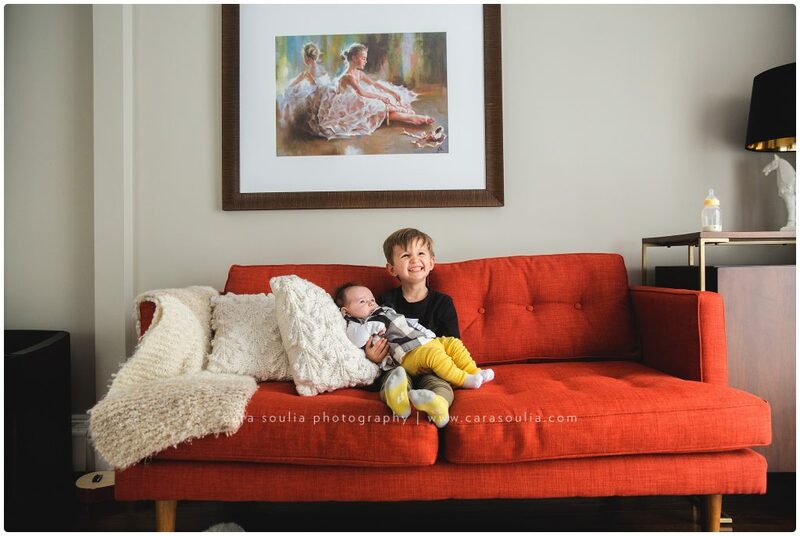 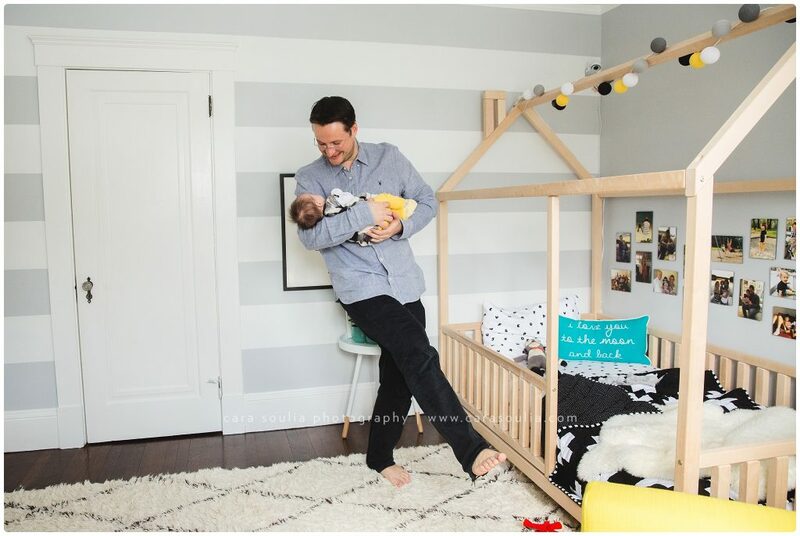 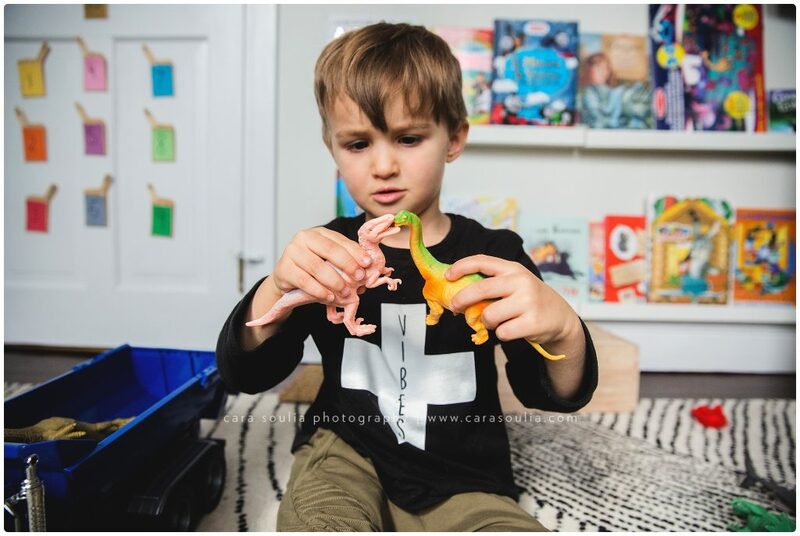 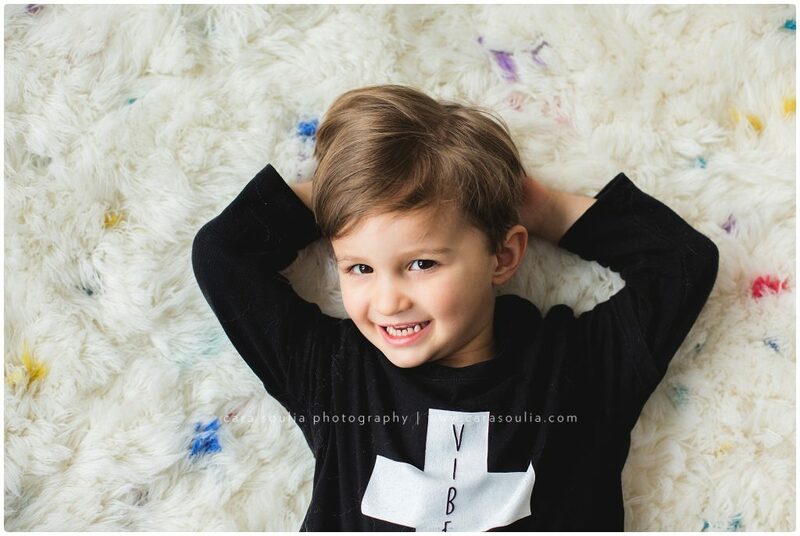 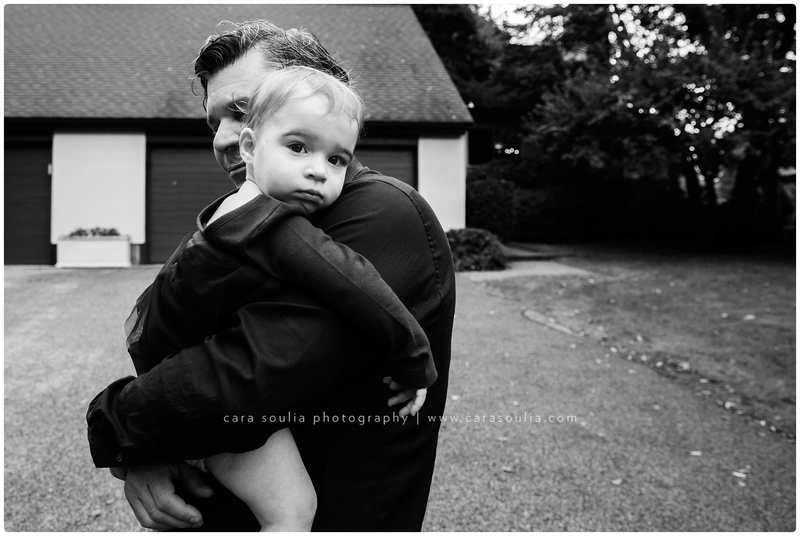 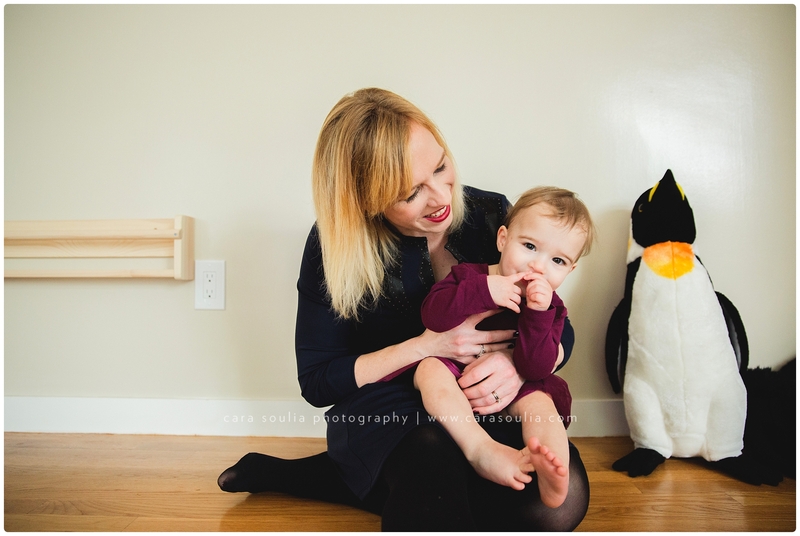 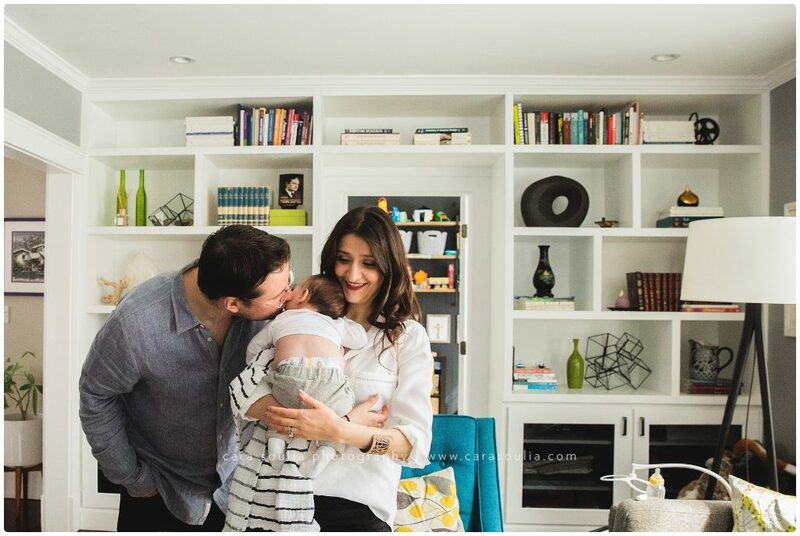 Brookline Family Photography by Cara Soulia. 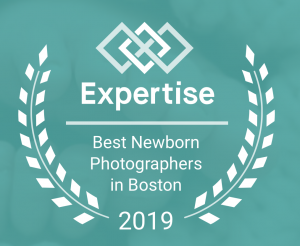 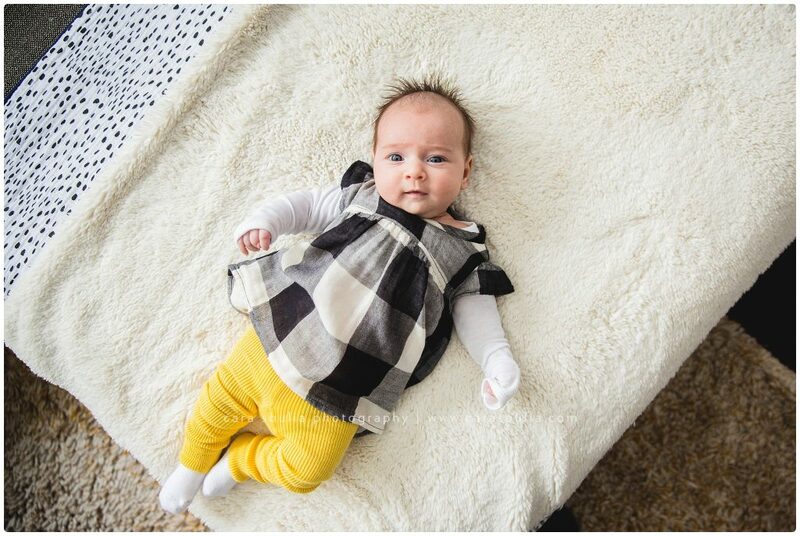 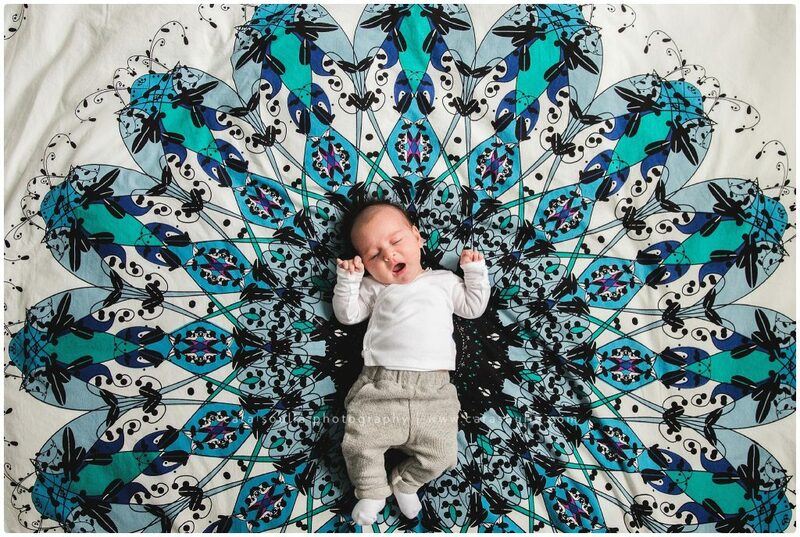 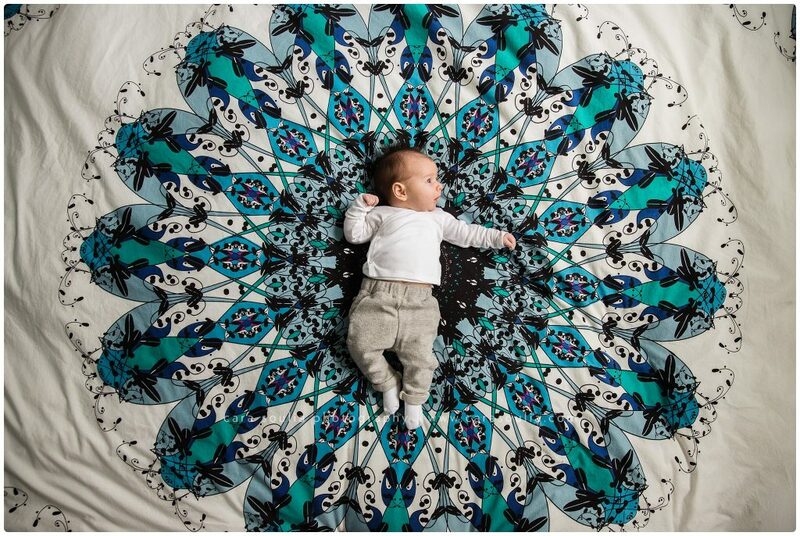 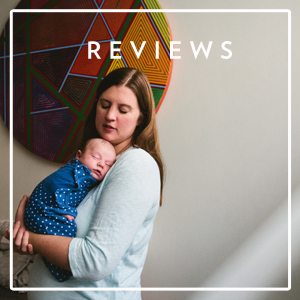 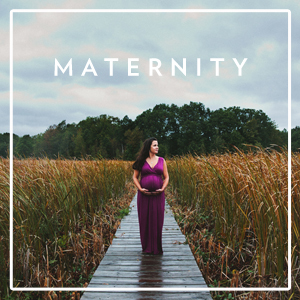 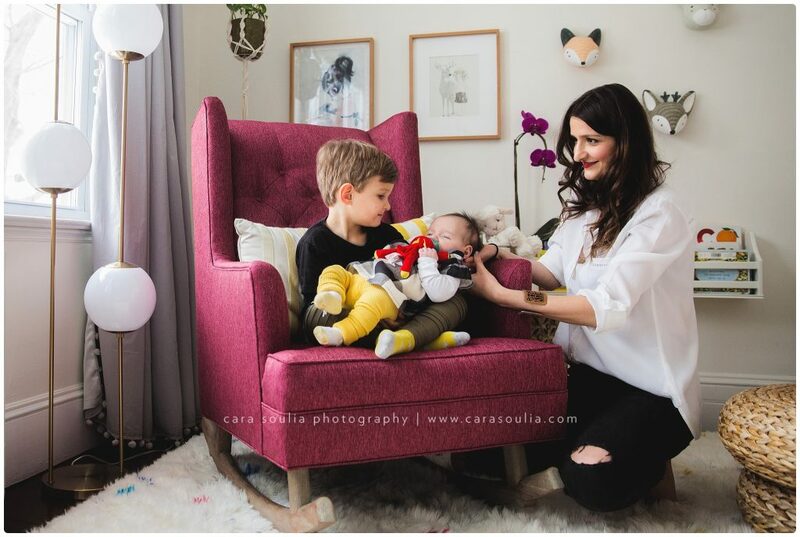 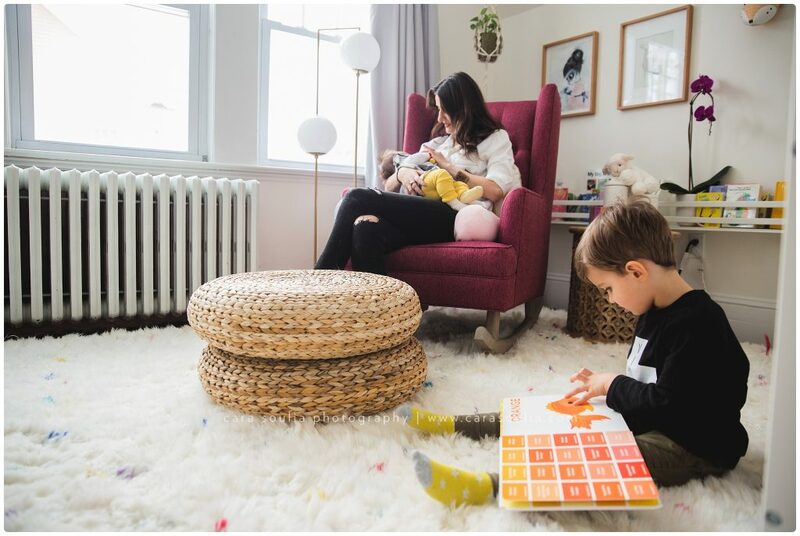 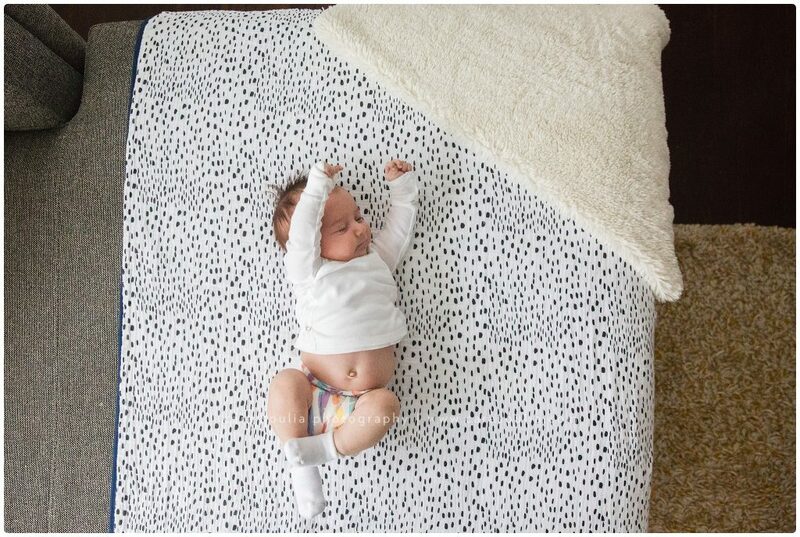 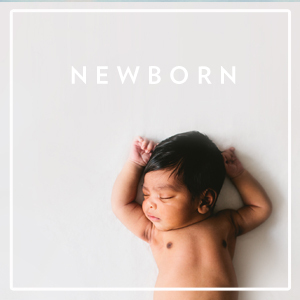 Cara is a newborn and family photographer who specializes in capturing natural moments and connections in a beautiful and colorful way. 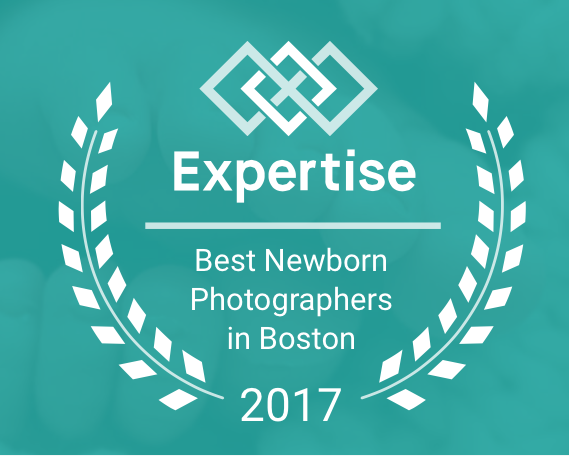 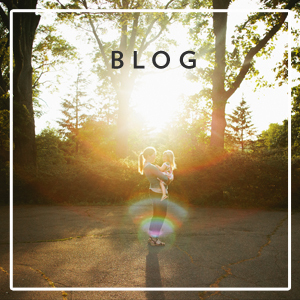 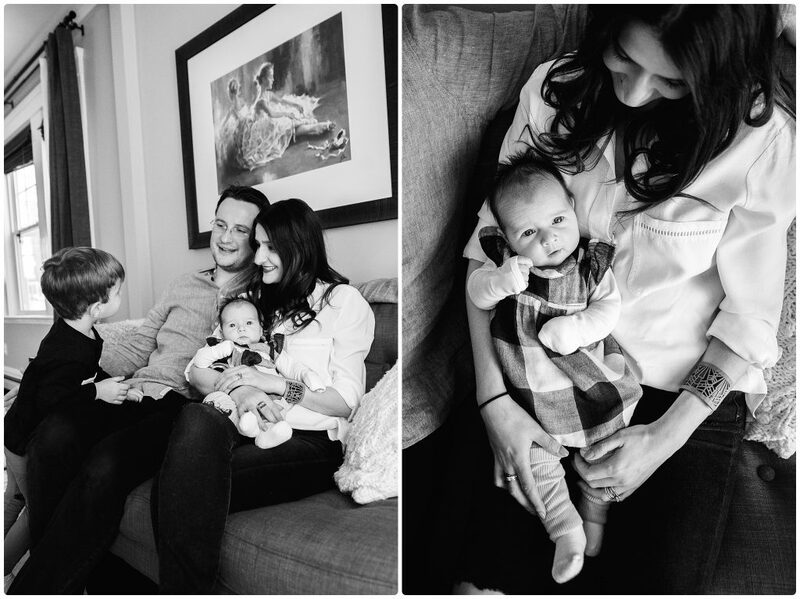 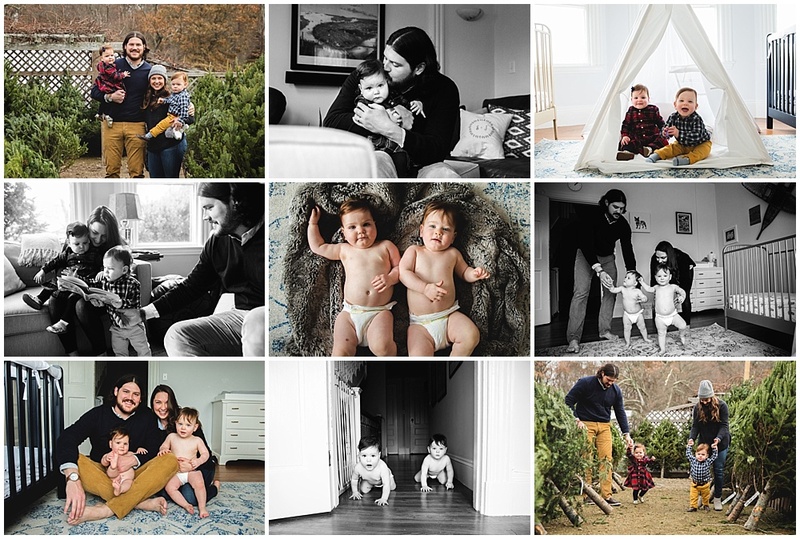 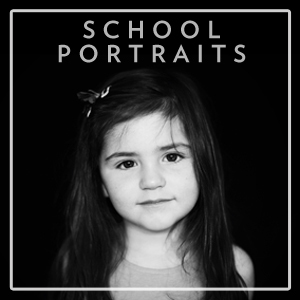 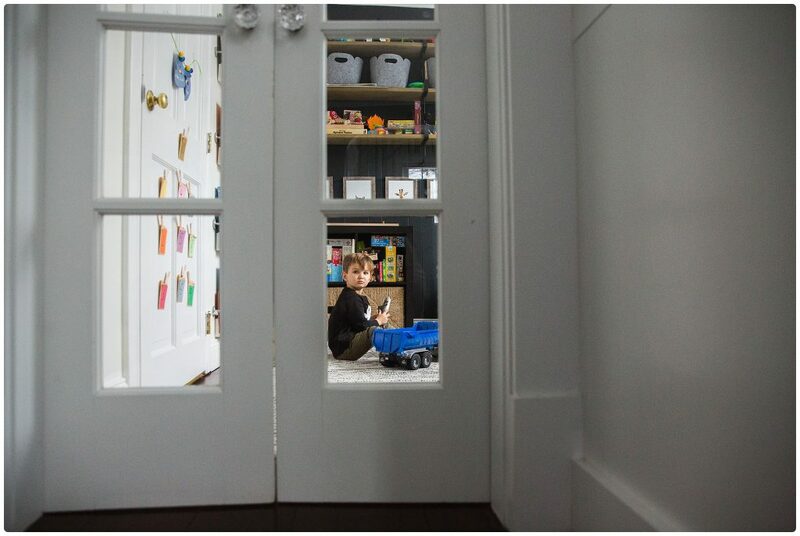 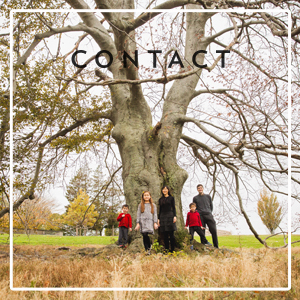 Cara has been photographing families in the Boston area since 2011. 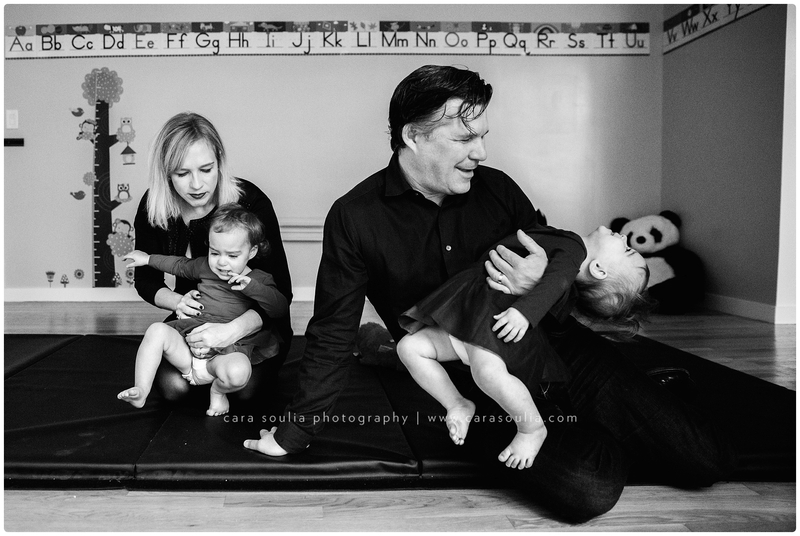 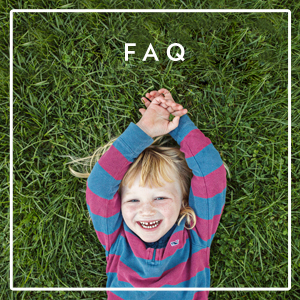 Check out more family sessions or get in touch to find out more about having a photo session with your family!